Our project for the urban park of Sacca San Mattia consists of reinvesting the island in a Venitian, multi-functional approach to urban planning, in the context of an enlarged metropolitan, touristic center. The Drip Feed project on the Island of Sacca San Mattia puts into place an above ground Ulva rigida cultivation device that is in keeping with the Greenfuel system. 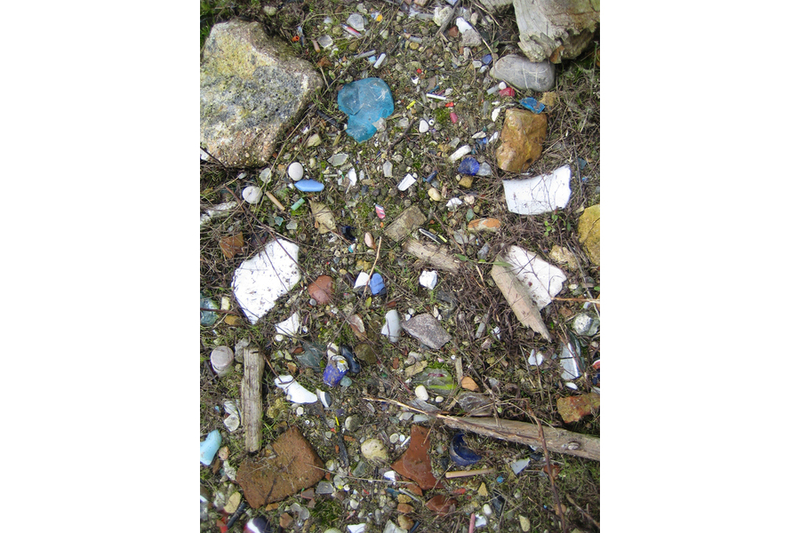 A Saprophyte structure that ingests polluted waste from local industry. 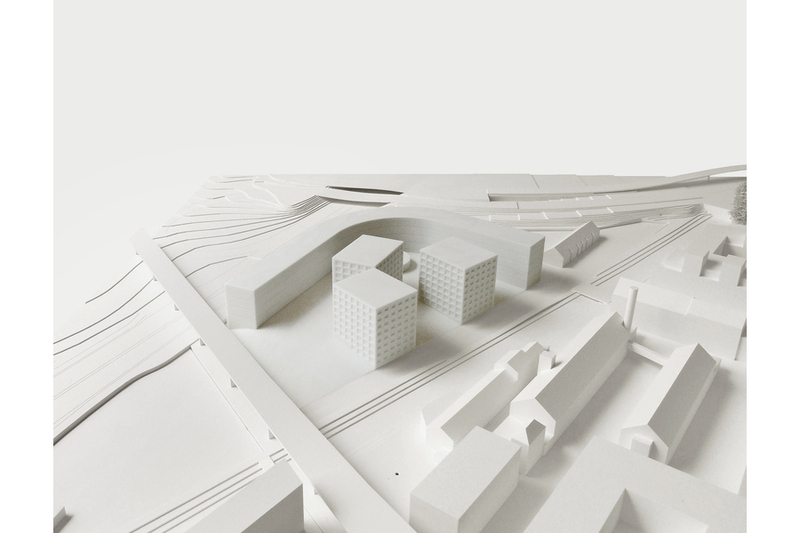 In its day, No Stop City, by Archizoom defined the factory and the supermarket as the key points to the city of the future. In other words, the places where the system turned its own ideological programming into full-scale reality : money's form of logic brought to its extremes - a high level of integration between production and consumption. In a sense, this integration between production and consumption is carried out in the project Drip Feed : the planned construction of an industrial farm, where nothing can be removed, yet everything is for consumption on the site. Venice and its lagoon, a world of languid sentiments, of decadent love, the city of lovers, the place to take refuge far from the continental metropolises, while admiring the artistic beauty of this insular city. With the collaboration of Bollinger + Grohmann, France (Structural engineering). 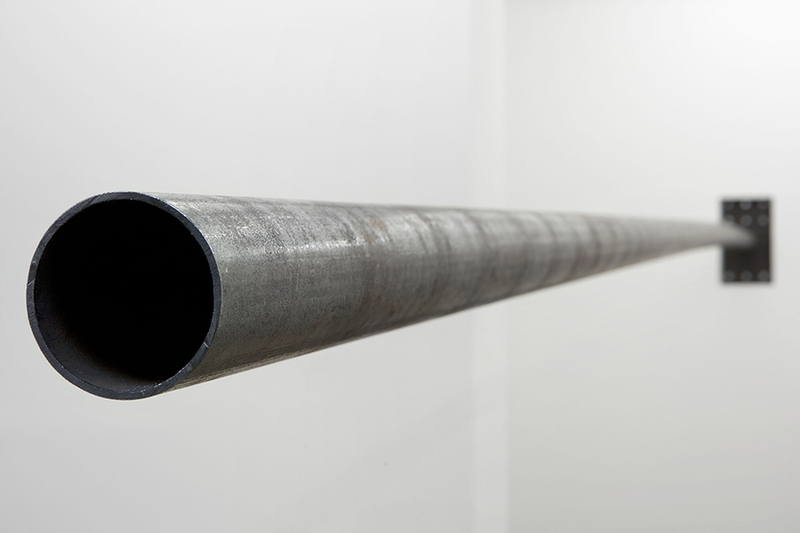 This beam is hung by only one of its ends to the wall of the building that contains the gallery, literally crossing through the envelope of the “White Cube.” Positioned in the center of the gallery’s wall, it takes the measure of the exhibition space. Weighing 41.876 kg, 76.1 mm in diameter and 7322 mm in length, this object necessitates being fixed to the wall at 92.3° so that both extremities of the beam are at an equal height. 2,3° more than 90° which define the exact perpendicularity of a horizontal line from the wall. 2,3° which allow the cantilevered end, deformed under his own weight to find the level of its fixed side. Fort du Luxembourg, Metz, France. The grid as a source of variability. 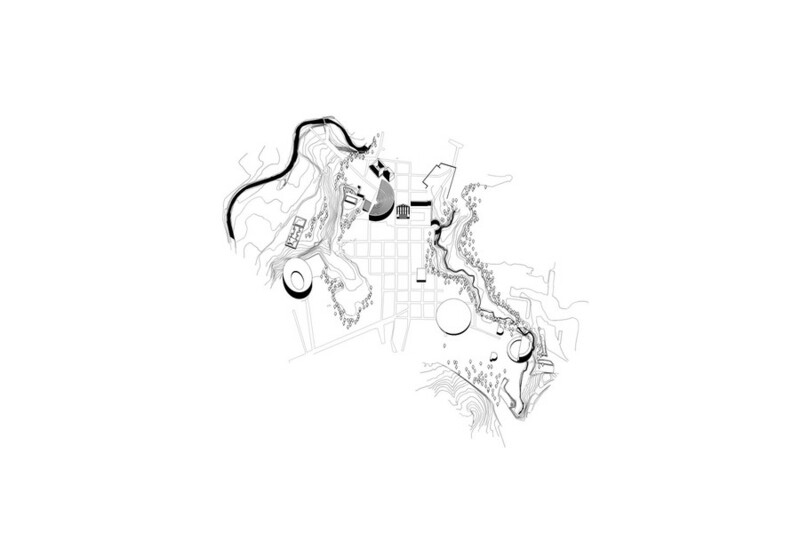 In using the grid the idea was not simply to optimize the schematic composition in an economy of space, but rather to affirm its validity and continuity regardless of program and function. 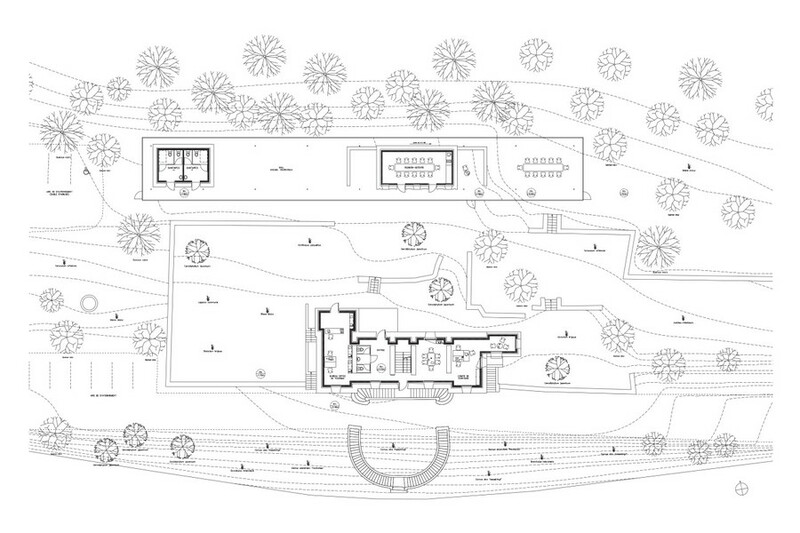 The grid here is not necessarily constructive, but a formal expression of spatial extension. The Centre Pompidou Mobile project is a shifting structure, without center, hierarchy, or periphery. Its boundaries are those defined by the program. Our project is an abstract space, neutral and free of iconographic connotation. 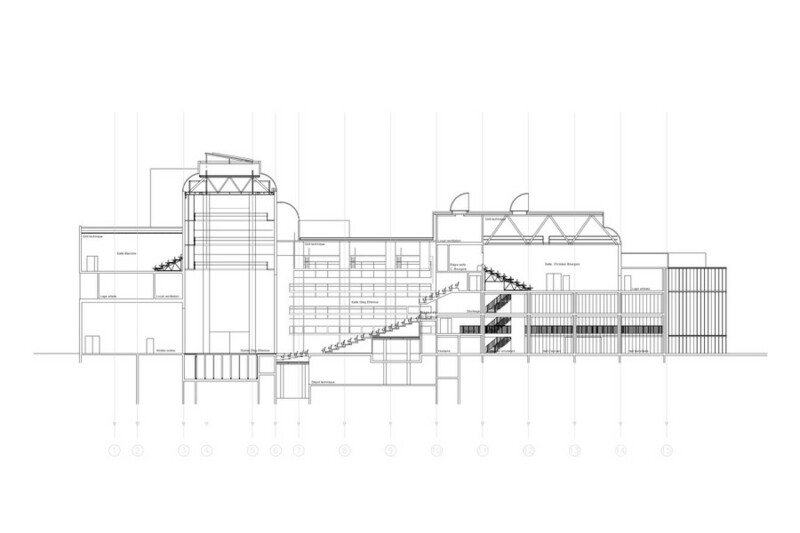 An abstract architecture where space is defined as an availability of uses. It is an architectural system which allows for the articulation of spaces that are identical in surface (6x6m) but qualitatively unique (light, volume, temperature ...). An "indifferent architecture", it guarantees changing environments of varying quality. 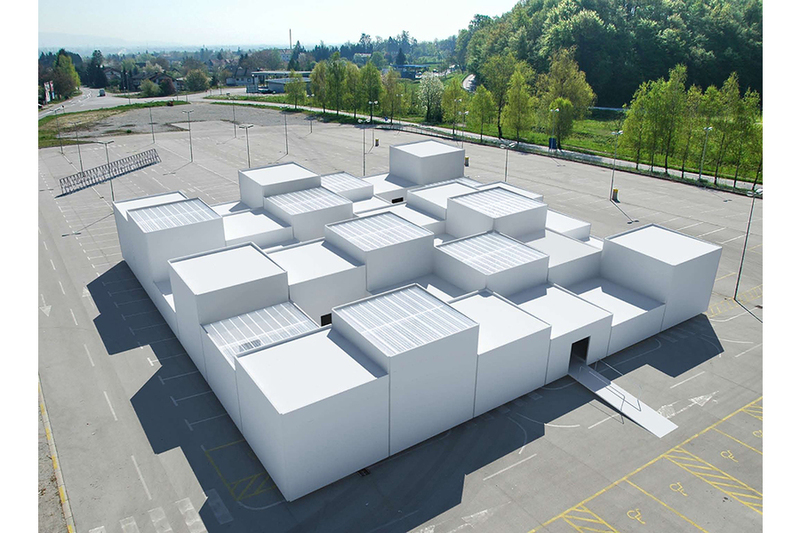 Temporary collective housing for the performance Feuillets d'Hypnos, 237 actions pour la scène. Cour d’honneur du Palais des papes, Avignon, France. Feuillets d'Hypnos, 237 actions pour la scène was performed at the Cour d'Honneur in the Palais des papes for the 60th anniversary of the Festival d'Avignon. This unit of residence serves a literal purpose : the troop of artists lives on stage in the Cour d'Honneur with their families, for 24 hours a day during the whole of the three-day performance. A circumstantial community thus brought itself into being, and took the stage to speak and recite the poetry of René Char every evening. 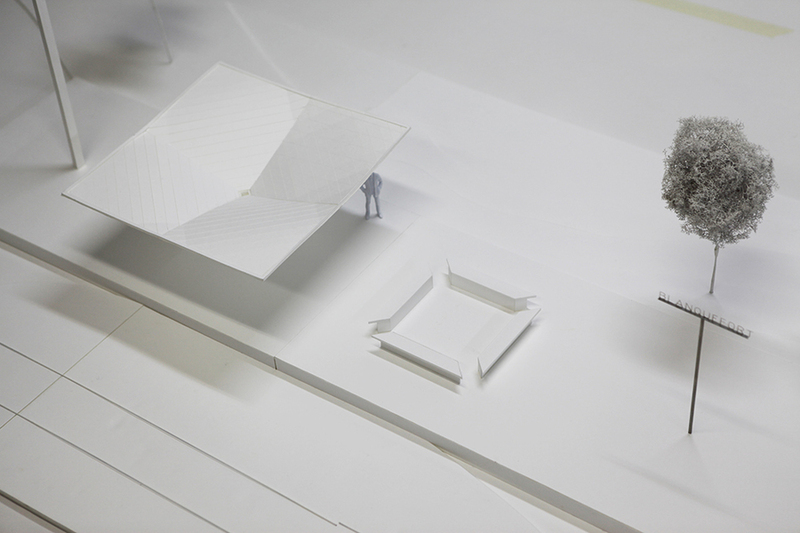 The performance space is substituted with functional programming: a kitchen, a bathroom, a badminton court, a small amphitheater, a public gathering space, and an ensemble of cabin bedrooms. The seemingly standard form of this architectural structure "3 Days" (3 days of set-up, 3 days of performance, 3 days of dismantling) was drawn up in tandem with the project's registration on the site for the performance dates of the 15th, 16th and 17th of July 2007. It is presented as a series of climatic modifications that respond to the different micro-climates within the Cour d'Honneur. The stage is re-territorialized in function with the potential forms of habitat made possible by the climate of the site : from cooler to warmer, from the most artificial to the most natural, from east to west. Cultural Center in Calvi - Balagne. 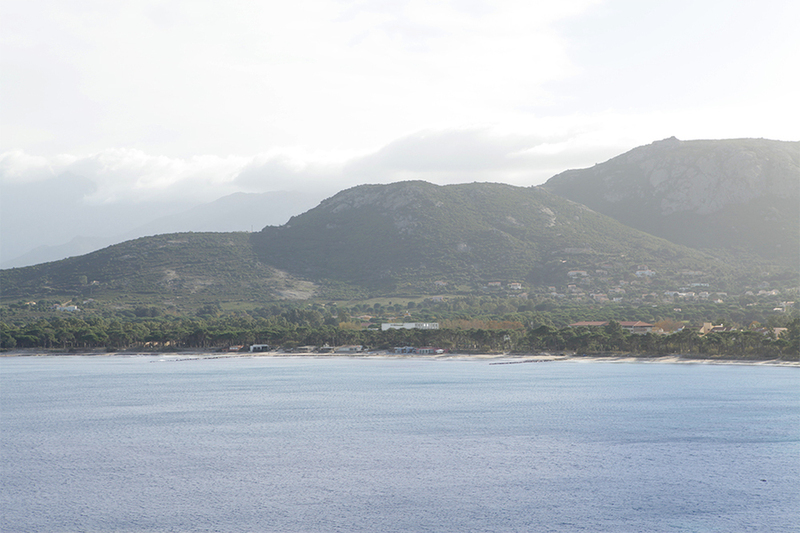 Calvi, France. All at once sculpture, architecture, and garden, Le Jardin des diversions is constructed with materials commonly found in modern architecture: glass dyed in the mass and steel, fundamental materials of modern architecture. It is composed of six layers of glass panels dyed in black (38 percent transmission of light) that form a regular, 250 cm‑high grid of twenty-five 500 × 500 cm cells. A mirror when seen from outside the structure, the dyed material allows for the transmission of light and the transparency from one “layer” of the pavilion to the other but only to a certain extent. Wherever the observer finds him- or herself, the transparency is not total throughout the entire structure. The openings are set up so that the gaze cannot traverse the whole apparatus from north to south or from east to west. 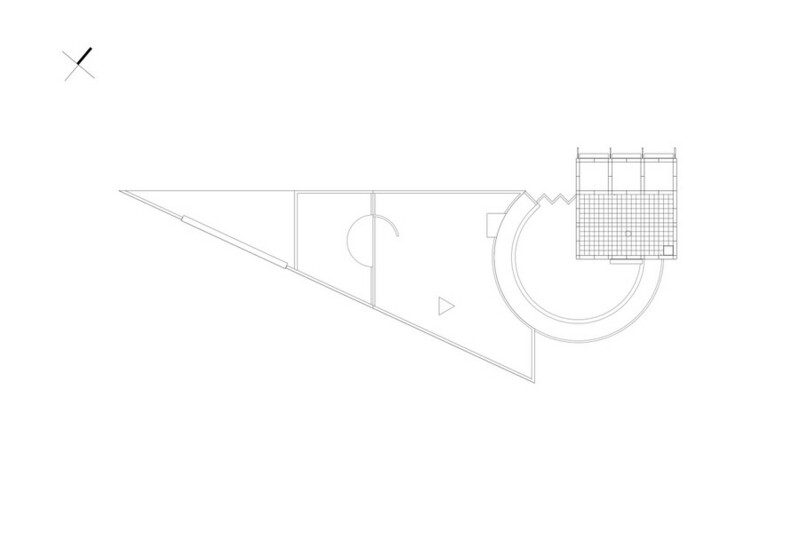 This pavilion is organized in a radioconcentric way, from the center to the periphery. But unlike the panoptical principle, the gaze, from the central cell, constantly runs up against a wall. 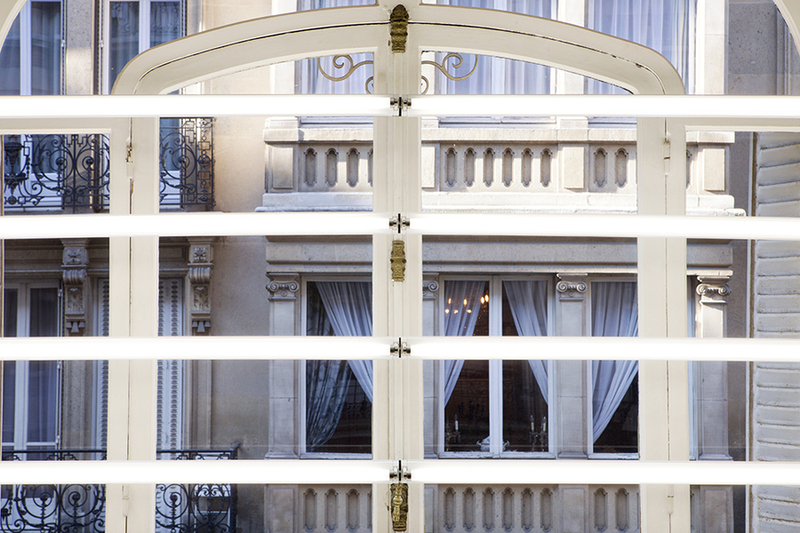 Each layer of glass is qualified by the same degree of transparency. The accumulation of all of them produces a phenomenon of absorbance and therefore of the pavilion’s relative opacity. 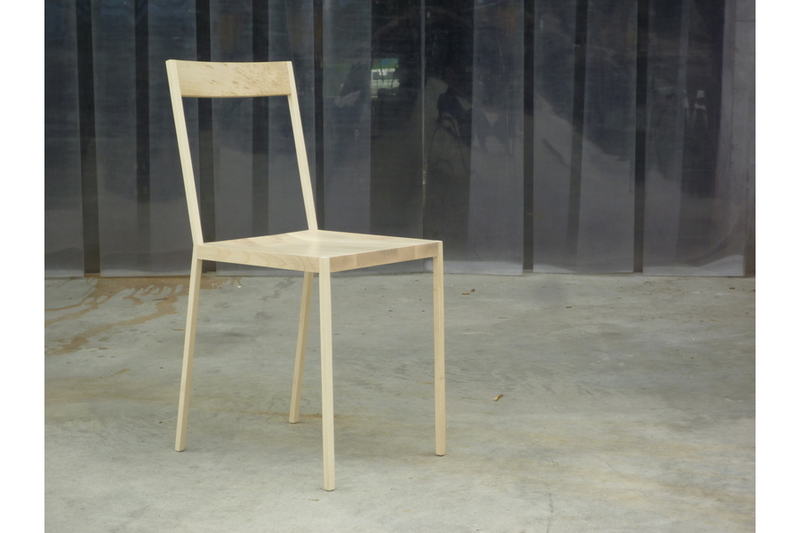 The chair results from the coherent assembly of solid sycamore, the seat's thickness of 3cm and the back's 1,5cm board, with the steel structure, the legs and stiles of which are covered by a 0,25cm layer of the same wood. The association of solid wood on a fine steel structure generates an exchange of forces, giving the finished object its stability and solidity. The wood is therefore not a visual, aesthetic cladding, but a structural element, bracing the chair in three dimensions. 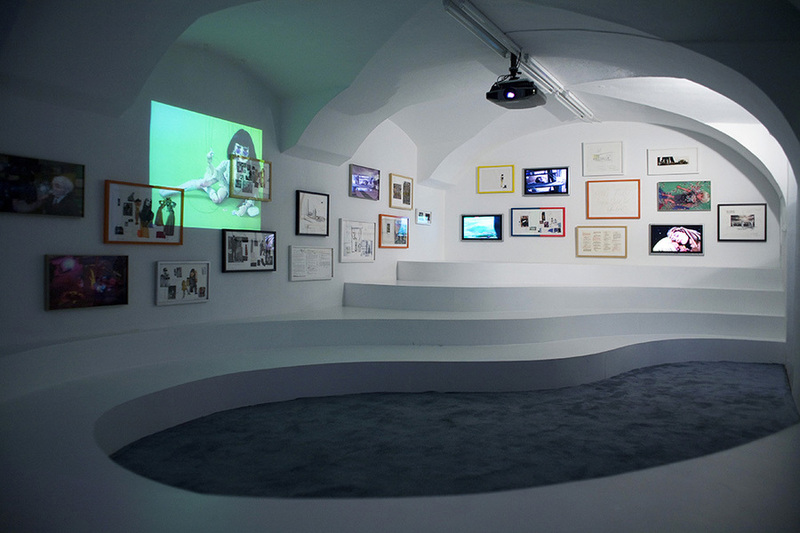 Combine is a fusion of documentation, new video, special effects, text, sound and drawings by the artists. It does not follow the linear nature of the puppet show but presents a new vision designed for a video viewing situation. This installation is designed to use two overlapping Hi Definition projectors to form a collage of images that extend the world of DTAOT. PVC colored adhesives. Dimensions variable. The three primary colors for additive synthesis are placed over the gallery’s sole bay window, thanks to which the space is naturally lit. Reinforced by electric lighting, the natural light penetrates into the space of the gallery and crosses through this inverted prism. 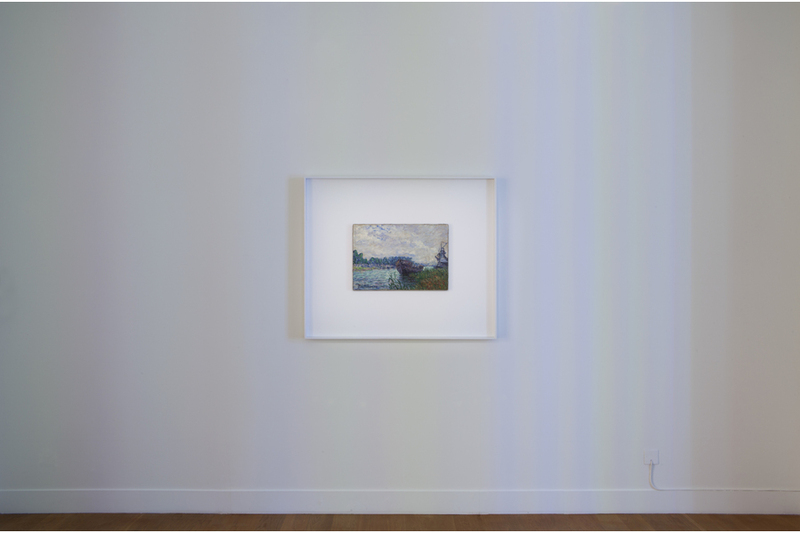 Projected onto the walls, this light in association with the color filters progressively creates a synthetic white that is superimposed over the gallery’s white walls several centimeters away from the bay window. 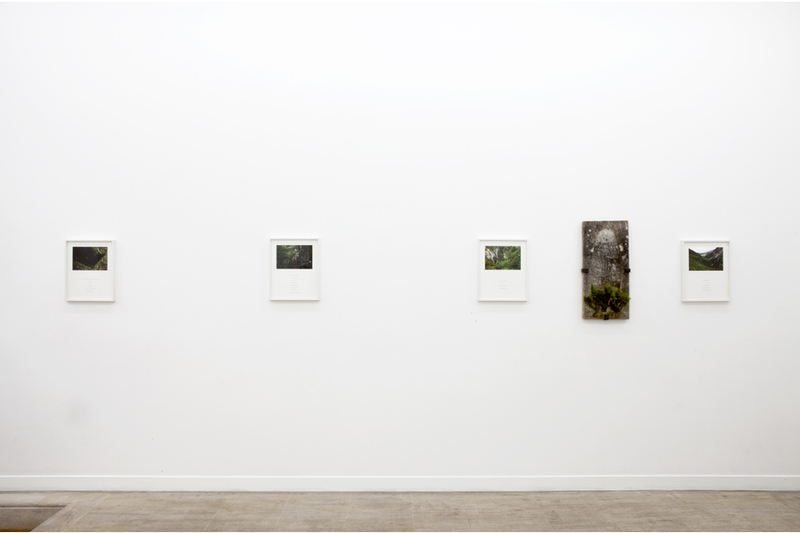 Series of 5 photographs, 5 x 35 x 35 cm. Printed on Baryte paper. Collaborators: Théo Vachon (architect), Guillaume Couturier (sound engineer) With technical support from Roosens Bétons and MOOS Licht. 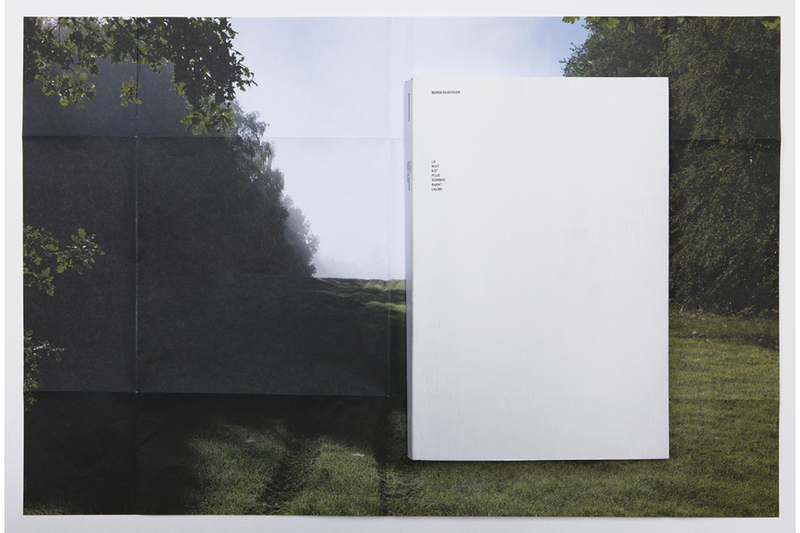 With support from Solo Galerie, the Fondation Marta Pan - André Wogenscky, Natalie Seroussi, the Musée des Beaux-Arts de Lyon, Les Editions de Minuit and Catherine Robbe-Grillet. No tears for the creature of the night, a system for theatre or museum, simultaneously links sound broadcast of a literary creation, a piece of architecture, furniture, a light environment, sculptures, pedestals, and an audience. 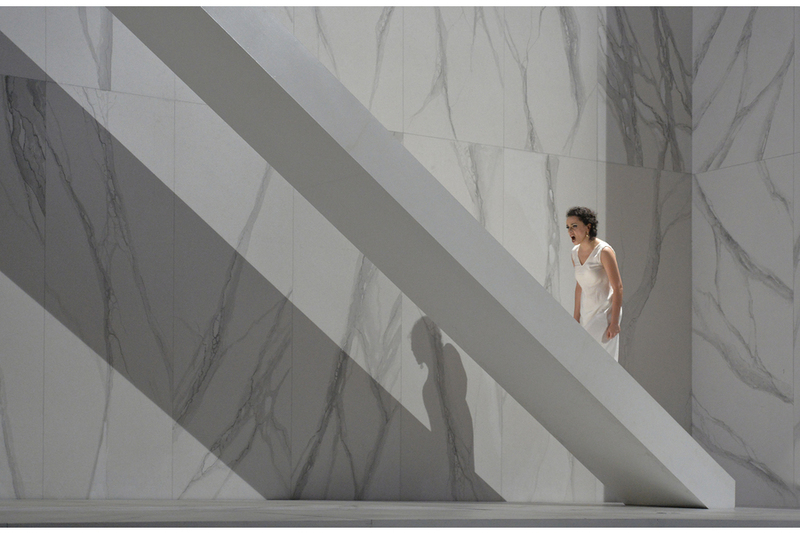 In other words, a new version of Alain Robbe-Grillet’s The Secret Room, performed by actor-director Frédéric Fisbach, mineral surroundings, walls made of concrete blocks, circular benches, three modern sculptures, LED sources, an audience. La chambre secrète, The Secret Room published in 1962 in Instantanés (Editions de Minuit), was a commissioned piece of writing. It is a short story inspired by a painting chosen by the author. 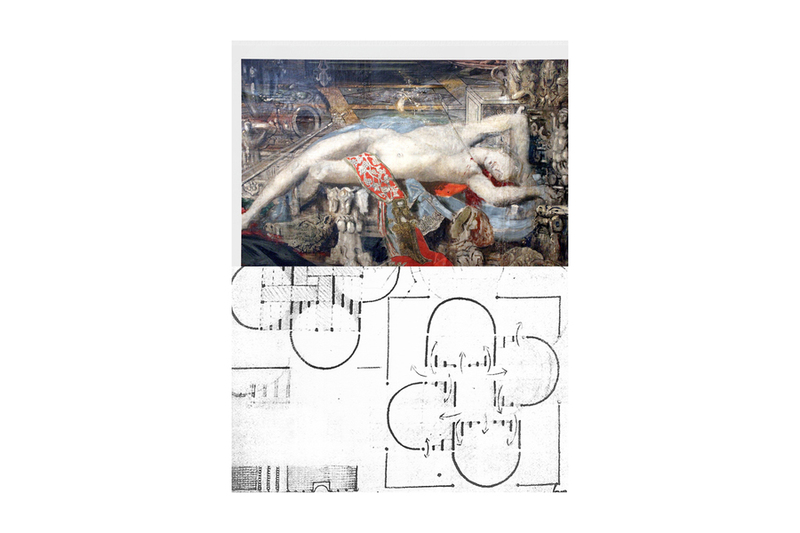 Robbe-Grillet imagines a painting by Gustave Moreau that never existed. The text, constructed in three parts like a Lied-Sonata, is reminiscent of the leitmotifs that Berg used in Wozzeck. An introduction symmetrically aligned to the Conclusion. The “circulating” central part that dislocates the symmetry. 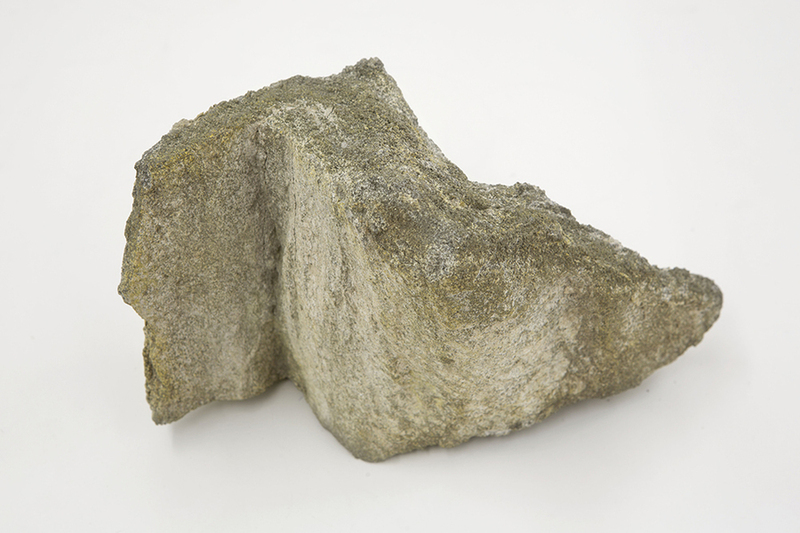 Three “fields” of substances (of differing energy weights) both acted and revealed by the structure of the piece. Sinusoidal dynamics, the times are sometimes below, sometimes beyond a vertical axis - it is a vertical time, a sine tilted a quarter of a circle with respect to its classical representation. Suspended time. No tears for the creature of the night is also a piece of architecture. It is a new variation of architect Aldo Van Eyck’s plans for the Sonsbeek Pavilion, a temporary pavilion, built in 1966 in Sonsbeek park in Arnhem. It was an ’open-air’ museum designed to host thirty sculptures by artists who included Hans Arp, Alberto Giacometti, and Constantin Brancusi. It was destroyed a few months after its creation and rebuilt in 2006 in the garden of the Kröller-Müller museum in Hoenderloo. Untitled, sculpture by André Bloc. This sculpture is from the garden of the Bellevue house at Meudon, the villa studio where the artist lived and worked. It was built between 1949 and 1952. Designed by André Bloc in Bellevue, it is built of concrete, stone and glass. Architecture, decoration, furniture, sculpture and landscape are all of a piece. The land, on which the dwelling house was built, slopes steeply to the north, giving great views of the valley of the Seine. Etienne-Martin’s Hommage à Brown combines the form of a totem borrowed from other civilizations, with painted surfaces characteristic of modern sculpture. 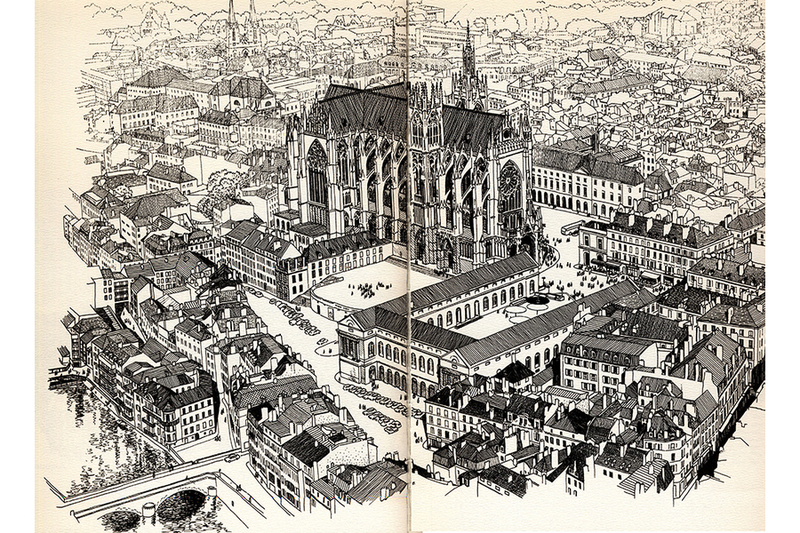 Etienne Martin, along with the architect Bernard Zehrfuss, was one of the ’Oppède Groupe’, a community of artists from various backgrounds: architects, painters, sculptors, musicians and even an organ builder. The whole work is lit in various ways, creating a gradient from 600 lux – 50 lux. The spectrum between these two values constitutes the many conditions for lighting works in a museum: from sculpture to drawing on paper, simulating daylight, from light to darkness. 8 digital photographic prints ink jet and silk screen prints thermochromic ink on baryta paper (40 x 32 cm). Edition of 1 + 1 EA. Courtesy of the artists. Porcelain, metal. Diameter: 25 cm. 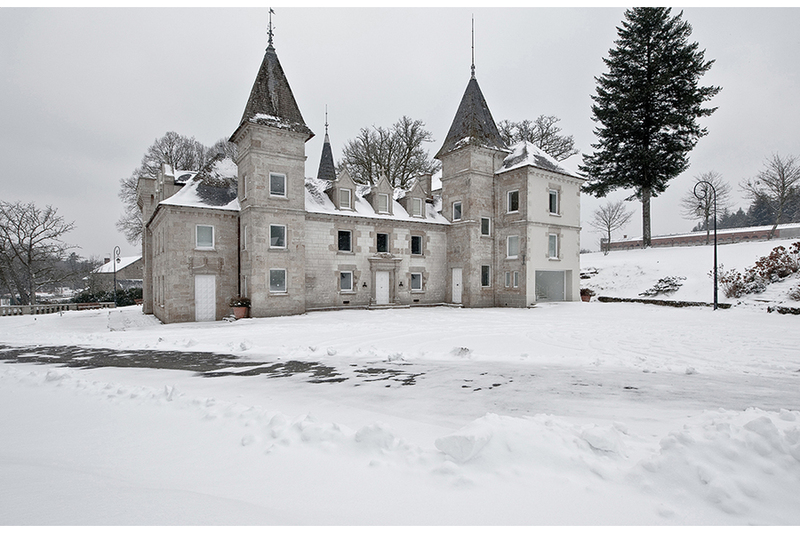 Astre Blanc was made in the CRAFT (Centre de recherche sur les arts du feu et de la terre) workshops in Limoges. Centre National des Arts Plastiques (CNAP) collection. 31 PAR lamps 750 Watt, metal, electric programmer. Diameter 65 cm, depth: 70 cm. Unique piece. Courtesy of the artist. 3 double-sided handwritten sheets (21 x 29.7 cm) placed on a neutral ph mylar sheet and framed in a plexiglass tank (35 x 43.7 cm). Steel tubes, steel plates, paint, screws. Piece in-situ. Courtesy of the artists. Massive oak. Inner diameter 180 cm, outside diameter 186 cm, minimum section 2.26 cm, maximum section 3.75 cm. Unique piece. Courtesy of the artists. 32 globes of silvery glass, metallic structure, 24 led sources, electric programmer. Argex, 91 x 105 cm, height: 550 cm. Courtesy of the artists. Electrically powered, this suspended piece is fixed to the wall of the gallery. It consists of 31 PAR lamps (parabolized aluminum reflector) with a power of 750 Watts each. The whole forms the upper third of a sphere. 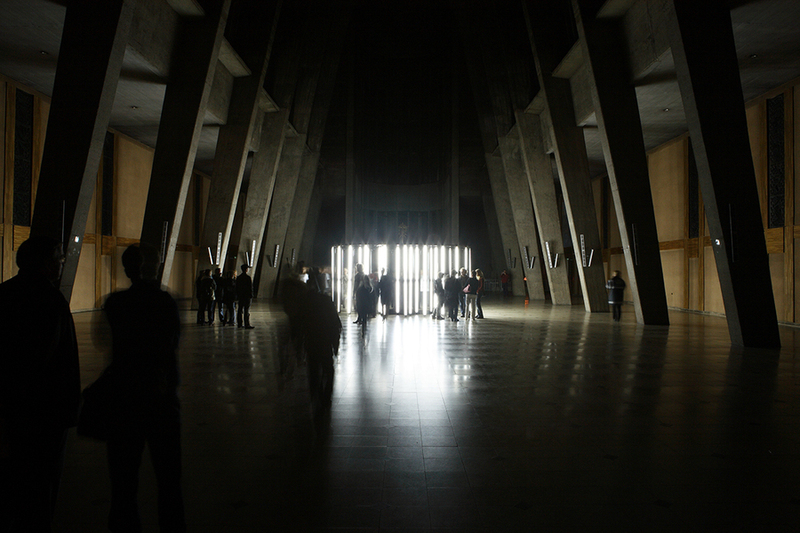 The luminous intensity of the first ring of sources, consisting of the 12 peripheral lamps, rises in two minutes and twenty seconds. Thirty seconds after the start of this progression, the luminous intensity of the crown inscribed in the peripheral ring and also constituted by twelve PAR lamps begins to grow to reach the level of the latter. Twenty seconds later the intensity of the crown in the previous series, which has six sources, begins to increase and in one minute the intensity of the central source reaches its maximum level. The intensity levels of all sources are equal to two minutes and twenty seconds after the program starts. Then, a second cycle starts faster, the maximum intensity is reached in thirty seconds. While the first cycle is marked by a variation of the lighting power from 8 to 40% of the maximum power, the power of the second cycle varies from 40% to 100% in 30 seconds. For five seconds, all the sources illuminate at 100% of their capacity. In the past five seconds, the intensity of all the sources, with the exception of the peripheral ring, decreases. The intensity of the PAR lamps starts to decrease 3.5 seconds later but faster. In four seconds to reach the initial level. Sources never go out. The first cycle starts again. At the highest level of lux, the temperature could increase over 60°C. These three sheets from Alain Robbe-Grillet were shown as part of Berger&Berger's solo exhibition "Une clarté artificielle, jaune et pâle" at the Comédie de Caen in 2016. This piece in-situ was presented in the gallery of the Comédie de Caen in Hérouville Saint-Clair. Fifty-eight columns, 4 cm in diameter, define an orthonormal space. They are placed on a regular grid which originates in the center of the stage of the theater of the Comédie de Caen, and is 140 cm apart in both directions. The rows of columns are oblique 33.75° with respect to the central axis of the stage, perpendicular to the front stage of the latter. The columns are fixed by their top to the ceiling of the gallery. Their feet float. In the space of the "Panorama", twenty-eight of these columns are deployed. The respective length of each is 3.90 m. In these rows, three columns are missing. In the southern part of the gallery, the floor is sloping. The length of each column varies between 2.60 m and 3.20 m. In these rows, three columns are also missing. 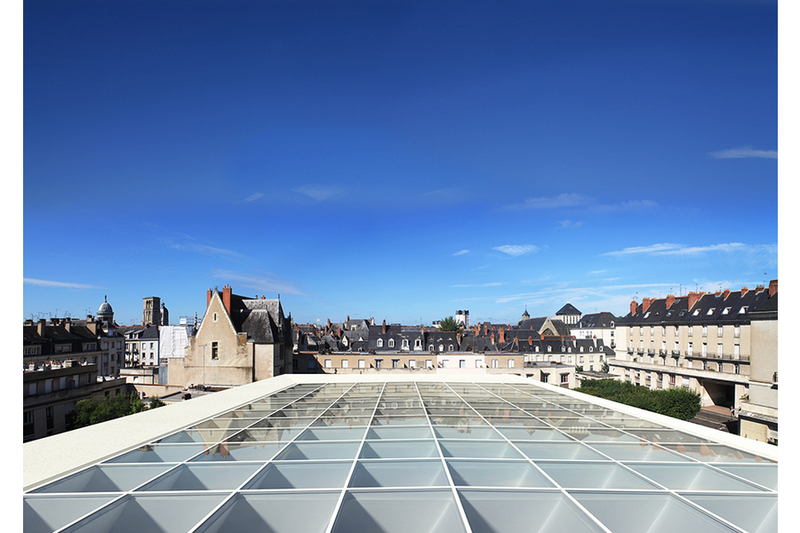 The "Panorama" is a space designed by the architect Eugène Leseney for the whole of the Citadelle Douce, of which the theater of the Comedie de Caen is a part. Its orientation is opposite to that of the facade of the building open on the protected place of the winds. This space is characteristic of the architect's project. It is literally a walk, a stroll and a panorama on the buildings of this district of Hérouville Saint-Clair. This massive oak sculpture formalizes a ring whose center of the circle defining the inner circumference is not common to that of the circle defining the outer circumference. This piece of cabinetmaking formalizes a revolution around a movable axis. 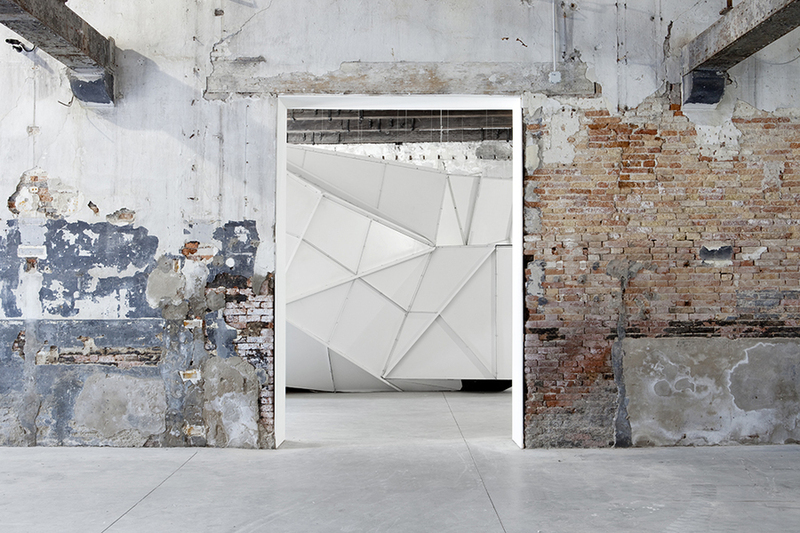 The 360 ° progressive deformation of this object, in two directions (x and y), defines both a plane parallel to the hanging wall and a micro topography in the exhibition space. The irregular volumetry of this ring is defined by the progressive and symmetrical modification of a section of 2,26 x 3,75 cm of oak. This quote comes from the text of Paul Valéry The problem of museums. With this text, Paul Valéry poses one of the essential issues of the museum, the opposition between the sensitive and the scientist, and allows to extend the reflection to the evolution of the museum during the twentieth century. Our project tries to reconcile these two notions. The museum space in the 20th century has evolved considerably. The former studio of Villa Sauber and almost all the rooms bear witness to this. 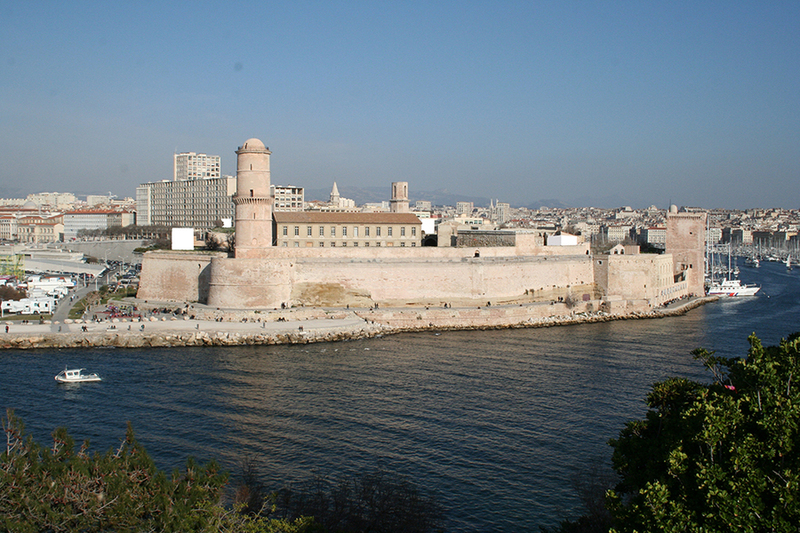 Originally largely glazed and overlooking the garden, they were gradually walled and "neutralized". Exhibition surfaces were won on the facade at the same time as the natural lighting was obscured in favor of artificial lighting. At the same time, false ceilings were created in order to conceal the air conditioning ducts and thus the moldings of the interior architecture. These rooms have gradually been transformed into neutral white boxes and controlled artificially. 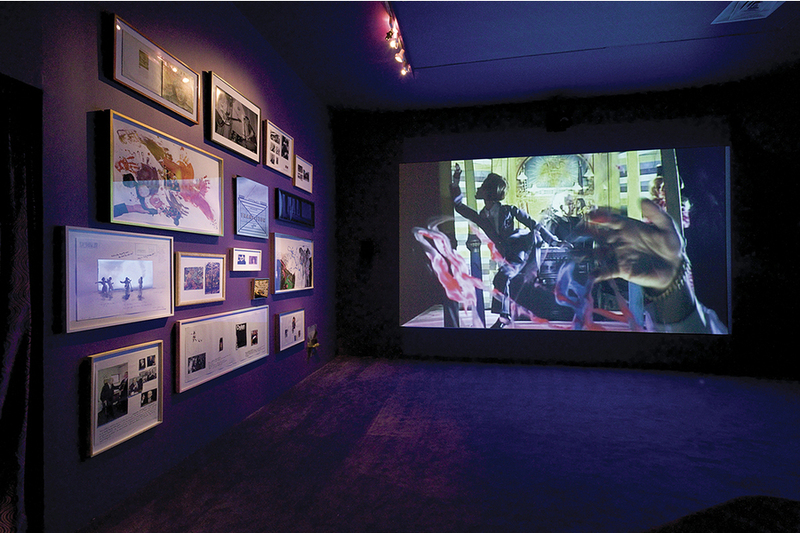 It should read a trend of museographic presuppositions of the twentieth century that wanted the exhibition places in the tuning fork of the artists' studios where the works were produced as well as the increased conservation requirements of the works themselves, which must today be presented in an ad hoc exhibition climate. Applying a homogeneous light, controlled in intensity freed from the UV, a hygrometry at 50% and an air free of its potential aggressive agents, it introduces a double "neutralization", aesthetic and physical. From the point of view of the museum space and a hypothesis of transformation of the museum, we propose to find a form of permeability between the climate of exposure and the climate of the outside as well as a dialogue reengaged with the architecture of Villa Sauber, in order to enrich the external / internal relations, natural / artificial, and consequently the conditions of exhibition and thus the perception and the very nature of the works. PVC colored adhesives, metal, fluorescent tubes. Dimensions variable. Photocatalytic paint and acrylic resin on canvas, 250 x 180 cm. Unique piece. Traditional concrete, sands and river aggregates rolled naturally. 3 x 30 x 66 cm. Unique piece. 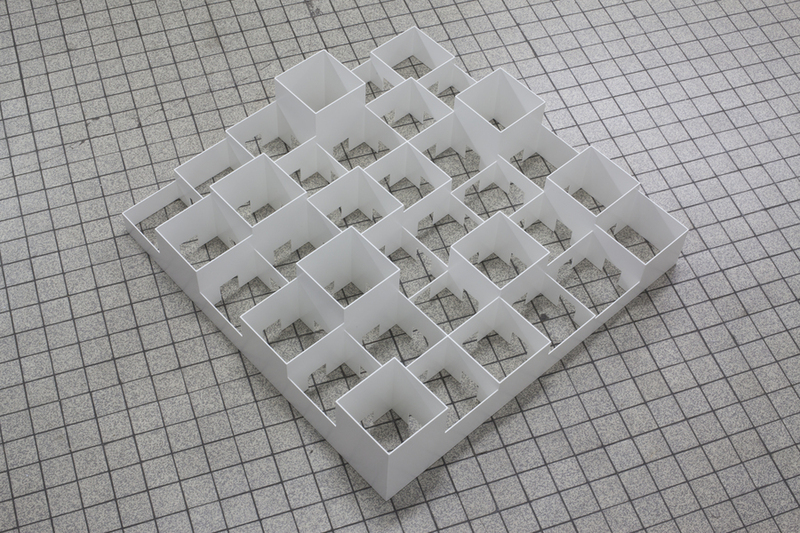 60 stoneware modules (35 x 35 x 7.5 cm). Anagama kiln firings. 179 x 430 x 10 cm. Unique piece. 2 silk screen prints thermochromic ink on polyester canvas. 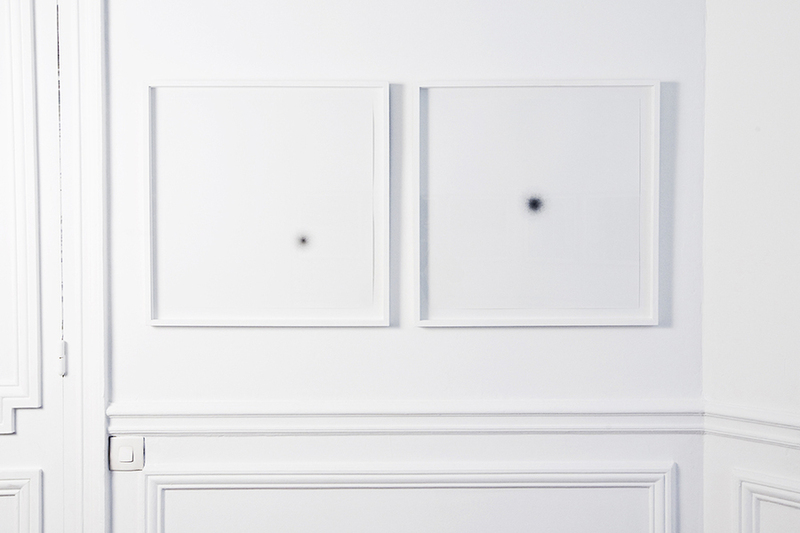 2 x (200 x 150 cm) Edition of 3 + 1 EA. Courtesy of the artists. The works of Francis Picabia, from 1899 and for almost ten years, prolonged the inventions of the Impressionists and the scientific discoveries of Michel-Eugène Chevreul on light and colors. The white frame of this painting, created especially for this exhibition, departs from the conventional formalizations of the gilt frame commonly adopted for "Impressionist" paintings in their time. The painters of that time have sought to renew their formalization by various methods of which they remain only a few testimonies. The frame became the very object of pictorial and chromatic research. The room, lit naturally, is affected by an artificial light and punctual from the ceiling but also by the diffuse from outside, through the window. Three primary colors of the additive synthesis are arranged on the glazing of the single bay of this room and reconstitute the chromatic spectrum. 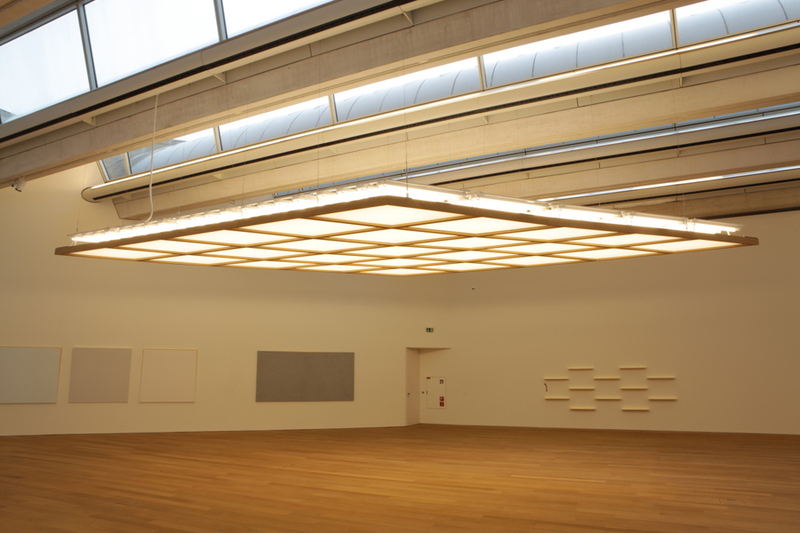 Natural light enhanced by electric light penetrates the space of the gallery through this inverted prism. 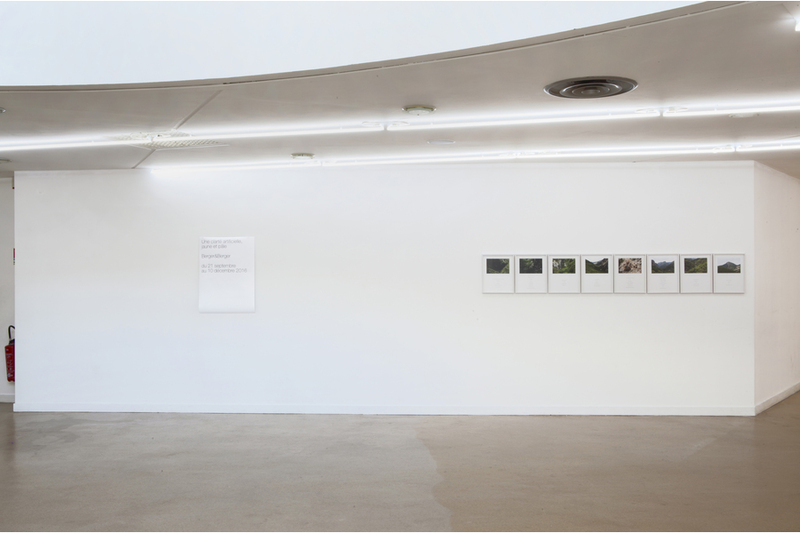 Projected on walls and floor, this light associated with color filters creates gradually, a few centimeters from the bay, a synthetic white which is superimposed on the white walls of the gallery. L’œil humain engages color as an atmospheric element. This monochrome is made with a photocatalytic mineral paint - Paint based on potassium silicate in aqueous phase and water based acrylic resin. The paint contains a specific pigment acting by photocatalysis effect by destroying atmospheric pollutants. It has algicidal and germicidal properties under the action of light in the presence of oxygen and moisture, acting both on volatile organic compounds, on gases, odors, molds, fungi and even bacteria and viruses. Three shades of white in this room: that of the painting of the walls of the gallery, that of the synthesis of the light coming from the window and that of the pictorial monochrome work. The monochrome created here, belongs to a paradigm posterior to that of the impressionists that Pasteur's discoveries on the invisible elements at work in the atmosphere have completely transformed. A serie of prints combining text and photographic images. This serie of works on paper tries to reconstruct the progress of a march made on July 20, 2014 in the gorges of Trevans, commune of Alpes-de-Haute-Provence. 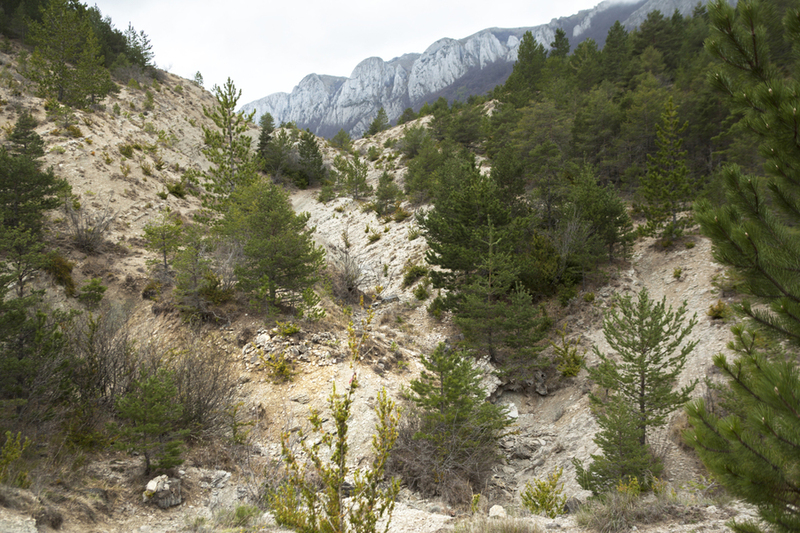 This march involved the development of an artistic commission project in the landscape. Various geographic, geological, demographic, meteorological, and certain physiological data of the walker are associated with the shots. This informations are silk screened with a reversible thermochromic ink, disappearing progressively above 21°C, the recommended temperature for the preservation of photographic prints. Fragments and prototypes, these objects are the work of the artist Denis Morog (1922 - 2003) and both form the elements of a material and plastic research on texture and light, associated with work on the large architectural scale and thoughts from the material and the processes that constitute it: the concrete and its implementation on site. This work consists of 60 modules (35 x 35 x 7.5 cm) made of stoneware "Flambe" baked in an Anagama oven made for the occasion. The oven Anagama, small vaulted architecture formalizes a recumbent chimney in which the raw pieces are arranged for cooking. During the four days of cooking in continuous fire, the rooms are traversed by the flames thus achieving not only its material definition but also the finishes by the flow of flames in the oven. The cooking temperature is between 1260°C and 1300°C. 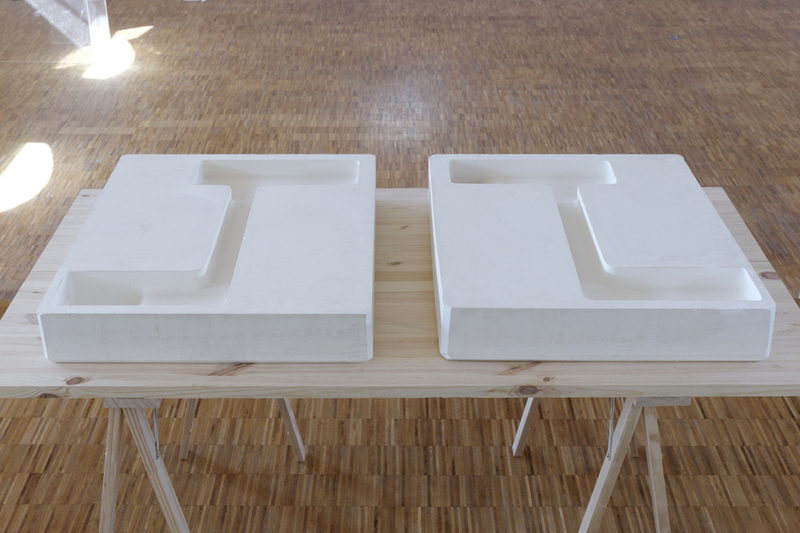 Graziella (1260 - 1300) puts in coherence a series of 60 identical modules which constitute a set arranged horizontally forming a fragmentary monolith. This sculpture would act on the climate of this room of the museum, the mass of clay has the property of passively regulating hygrometry. The passive regulation of hygrometry is superimposed on the artificial one that the museum's air conditioning system allows. Created with the collaboration of Robert Roy and Céline Linossier. This sculpture is a resumption of the "claude glass" or black mirror, an instrument of observation created by the painter Claude Lorrain. The black mirror or mirror of Claude Lorrain is a small mirror, with a slightly convex surface and tinged with a dark color. Enclosed in a binding similar to that of a sketchbook or held in a holster with cover, this device was in the eighteenth century the tool of artists, travelers and lovers of landscape painting. The function of the black mirror is to present the subject to be treated isolated from its environment and to fold the tones of the pattern, thus allowing a rapid determination of an optimal framing and a better appreciation of the distribution of the values. This sculpture constitutes a variation. The scale of the object is here more important and its use is sedentary and domestic. 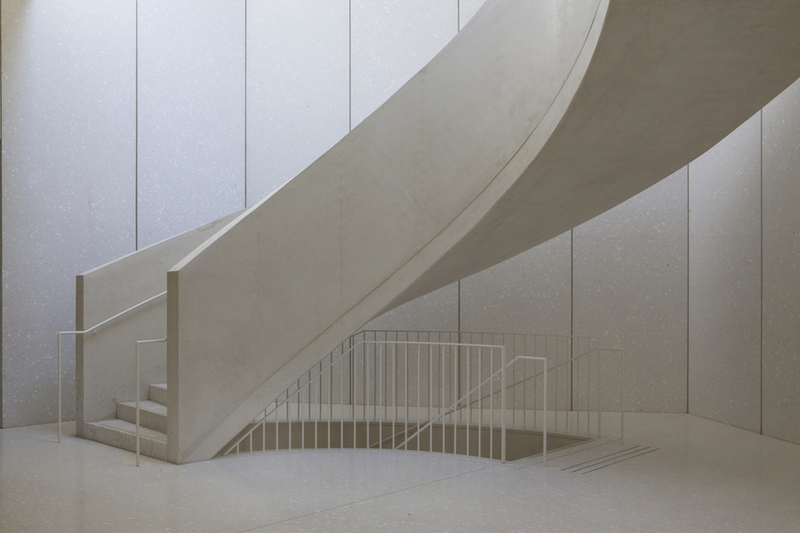 The observation here is limited to that of the museum's interior "landscape". The convex geometry of this glass part, initially flat glass sheet, is achieved by thermoforming. 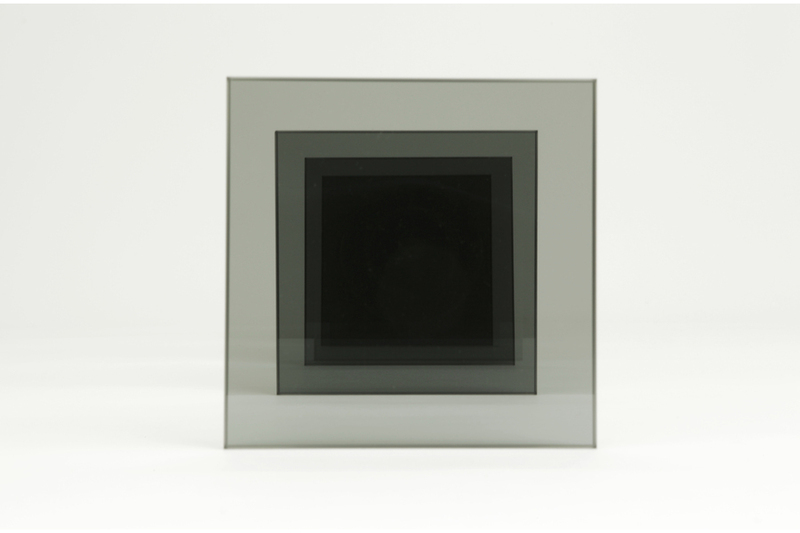 The opacity of the glass is obtained by the deposition of the carbon black. Combustion is also an artisanal operation of making the piece. The sculpture is located in the center of the exhibition hall, former studio of the painter Robert Sauber and facing east, towards Les corniches. This sculpture is the most famous work of this nineteenth century neo-classical sculptor. In 1835, Bartolini was commissioned by Rosa Poldi Trivulzio to create a memorial for her late husband. The thermal conductivity of marble is 3 (W/mK). 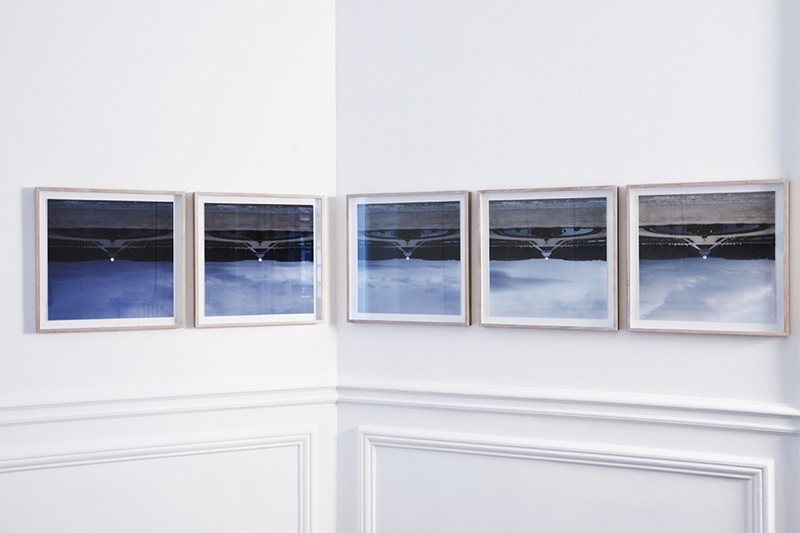 This diptych consists of two silk screen prints restoring an image of Monaco Bay. 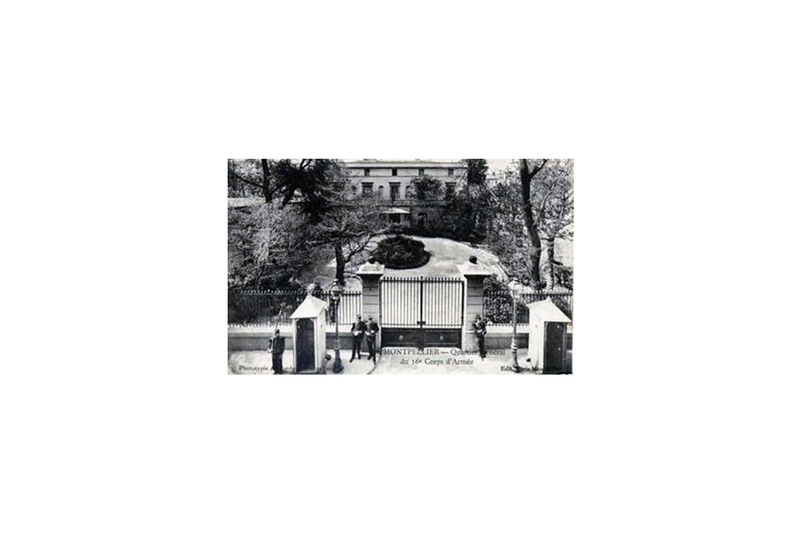 The point of view of this photograph is similar to that of Le Corbusier, for his sketch, Ici mon cabanon (le terrain), ici le prince de Monaco (February 15, 1955). Le Corbusier draws this sketch from his Cabanon. Nearby was built 26 years before, the Villa E1027 by Eileen Gray. The new image is taken from the roof of this villa, his point of view also contains a background common to the painting painted by Monet, La baie de Monaco, in 1881 (NMNM collection). This common background is « le rocher ». Each of the 3 Cyan, Magenta, Yellow (CMY) colors in digital photography is replaced by a black thermochromic ink. The thermochromic ink has the particularity of being thermosensitive. This varies reversibly depending on the temperature. Each of the silk screened thermochromic inks evolves at a specific temperature. All the inks constituting the image are visible below and up to 10°C; black ink replacing cyan disappears above 10°C; black ink replacing magenta, above 15°C; the black ink replacing the yellow disappears above 20°C. CMYK black is a standard black ink. A window of this room remains open for the duration of the exhibition. The outside temperature varies between 13°C and -3°C during the winter. Three female solo, three composers, three stage designs, two nights, one director. 2 exhibition galleries + 1 concert hall + 1 artist’s workshop on the Consandey square at the EPFL (Ecole Polytechnique Fédérale de Lausanne). The Prophecy is the creation of an ephemeral community, which gathers for the duration of a narrated story, conferences and concerts. December Saturday 20th Art et institution, peut-on rêver de nouveaux lieux ? Co-production: Thyssen-Bornemisza Art Contemporary, Vienna, Foundation 2021, New York, Walker Art Center, Minneapolis, and Voom/LAB, New York. Conceived by: Dan Graham; Visual Conception and Videos by: Tony Oursler; Installation, and Set Design: Laurent P. Berger; Live Band, Live Music: Japanther (Matt Reilly & Ian Vanek); Recorded Music: Rodney Graham; Script Adaptation: Dan Graham, Tony Oursler, Teresa Seeman and Sandra Antelo-Suarez; Script Editor: G. Roger Denson; Marionettes: Philip Huber from Huber Marionettes and Company; Pupeteers: Michael Carolan, Sarah Frechette, Daniel Luce, Kenneth Berman; Executive Producer: Miguel Antonio Roca; Production Manager: Valentin Essrich; Stage Manager: Matt Tierney; Sound Designer: Bruce Odland; Light Design / Video Operator: Urs Schönebaum; Props Designer: Eugene Tsai; Costume Design: Carlos Soto; Photography: Todd Eberle; Marionette Drawings: Marie-Paule Macdonald; Puppet Costume Design: Sandra Antelo-Suarez, Claire Pauley and Dan Graham; Puppet Costume maker: Sarah Frechette; Theme Song "Don't Trust Anyone over Thirty" by Rodney Graham. Envisioned as a genuine satiric history of the hippy generation and the end of the psychedelic era, the opera's tragi-comic narrative is the "reductio ad absurdum" of the hippies "generational politics" contained in the 1960s youth slogan: "Don't trust anyone over thirty". 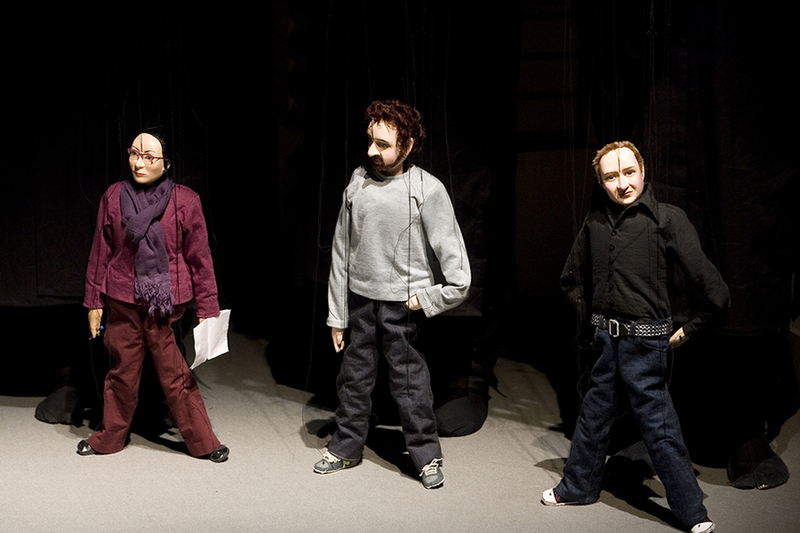 DTAOT is staged in a 50-minutes show, presented in a small theater built for the occasion, which involves both a puppet show, a punk concert and video projections. Lacquered steel, 55 × 55 × 20 cm. Exclusive piece. Steel tubes, epoxy paint, magnets, dimensions variable. Poster. 400 x 300 cm. Edition of 1. Mystère 04.96.79.01 / 79.24.15.00 was supported by the A.P.A (Advertising Postings Agency) of Rome, and printed in their facilities. Le Mystère, originally written Mistère, is a theatrical genre appeared in the fifteenth century. It consisted of a series of animated and dialogued pictures written for a wide audience, implementing stories and legends whose imagination and popular belief had fed. The supernatural and realism mix it. Prefabricated movie theater for 80 people. Arsenale, Venice, Italy. 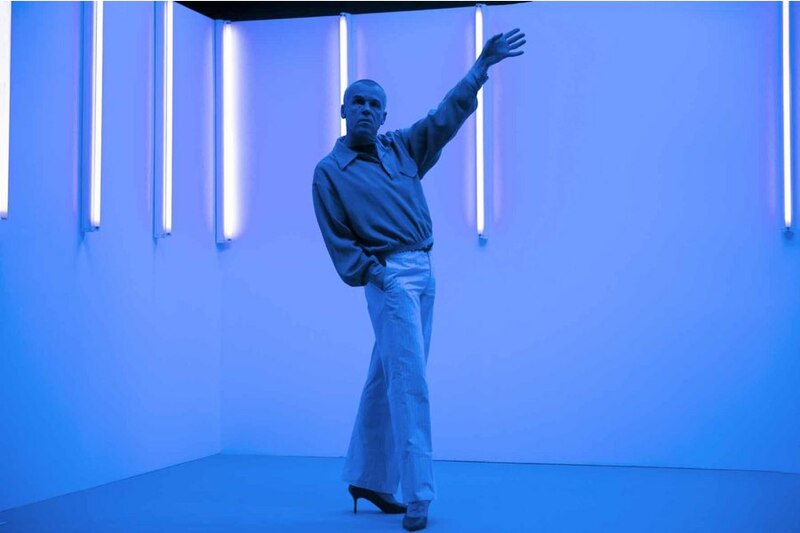 With the support of: Caterina Tognon Arte Contemporanea – Venezia, Thyssen-Bornemisza Art Contemporary, CULTURESFRANCE, Ministère de la culture et de la communication, Service Culturel de l'Ambassade de France à Rome, Alain Resnais et Ciné Mag Bodard, Lux, DCTP Info & Archiv, Garvan acoustic. The prefabricated movie theater gathers together a selection of works - films, videos, documentaries - realized by the invited artists and directors. A selection of pieces that seeks not to be thematic but propose a succession of moments. The film program is curated by Berger&Berger. The gallery, envelopes the annexed ruins. This "between two" constitutes a preheated space, a thermal "plug". This ambiguous space is an interior landscape to which few natural qualities of climate are removed : the wind (windows) and rain (the roof). It is a natural, "domestic" environment preserved by its central heating system and freed with artificial lighting. The accidental topography of the surface is conserved. 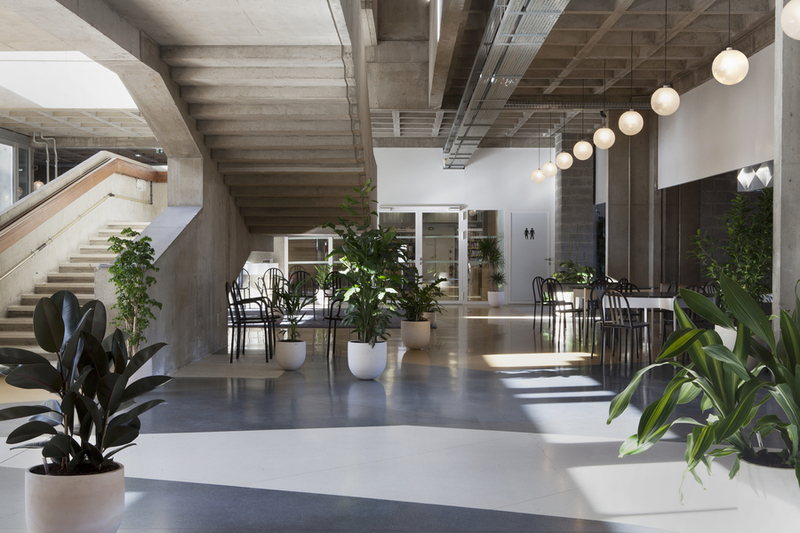 This location constitutes an intermediary territory between a humid forest and vernacular, artificially air-conditioned architectural structures. A "lamp" consisting of sixty four fluorescent sources, replaces the multitude of sources that currently illuminates uniformly the square. This public space is redefined according to the illuminance of 1500 lux under the "lamp" to 5 lux at the end of the square. 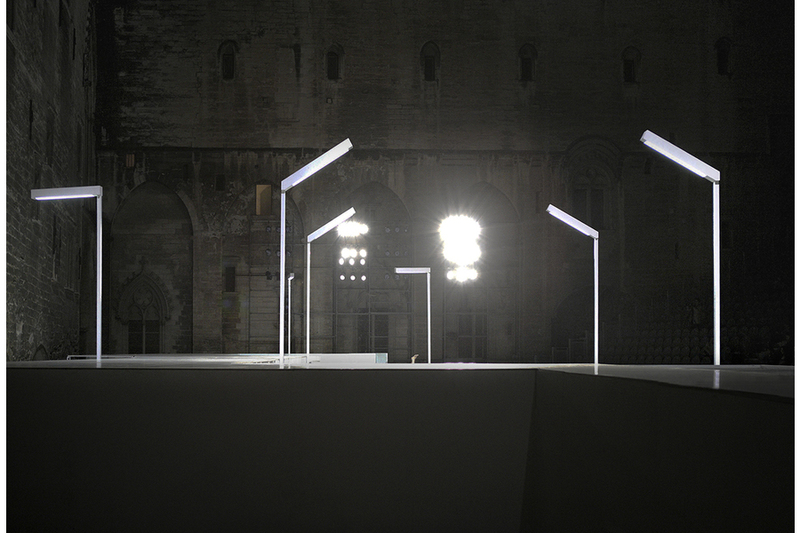 The light source, placed asymmetrically in the length, width and height of the square, enlighten unevenly in every way. Associated with the specific production of "parasols", this source will increase the disparity of public space defined by dark areas and bright areas. The "parasols" which will alternately house a variety of diurnal uses and nocturnal uses. The scenic apparatus for Mademoiselle Julie, a French version of the play that premiered in Shizuoka, is the almost identical reproduction of the one for Miss Julie realized a year earlier in Japan. The apparatus was reconstructed for the needs of an international tour. The bamboo wood was replaced by birch wood. Dimensions 56 x 35 x 12 cm. 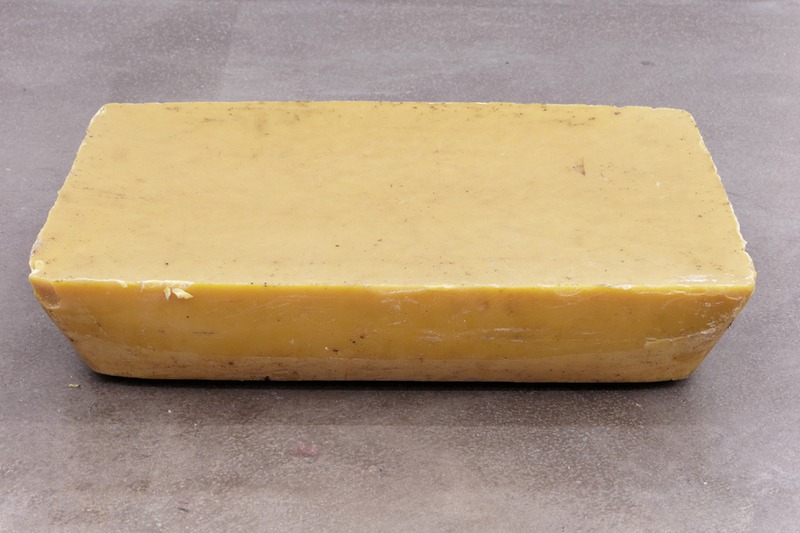 Plaster, 2 times 58 x 67 x 10 cm. Exclusive piece. 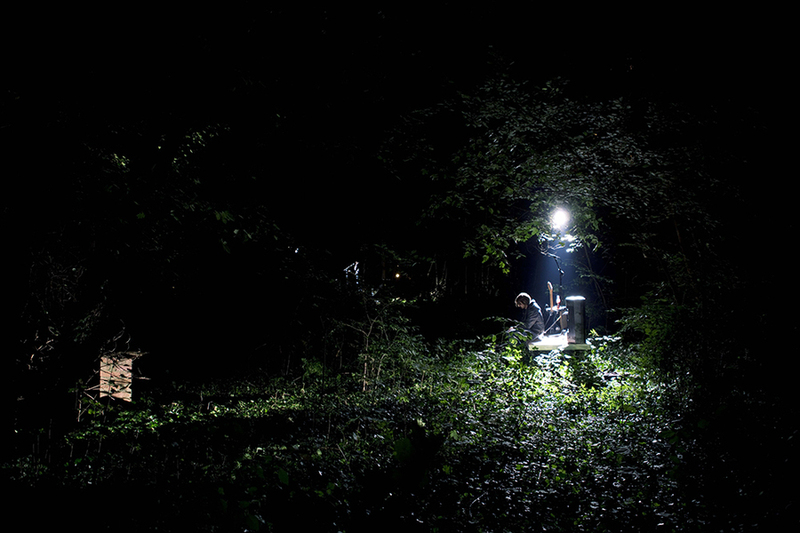 Notus Loci was made in the CRAFT (Centre de recherche sur les arts du feu et de la terre) workshops in Limoges. Dust of immersed tree stumps, epoxy resin, magnets, 170 x 390 cm. 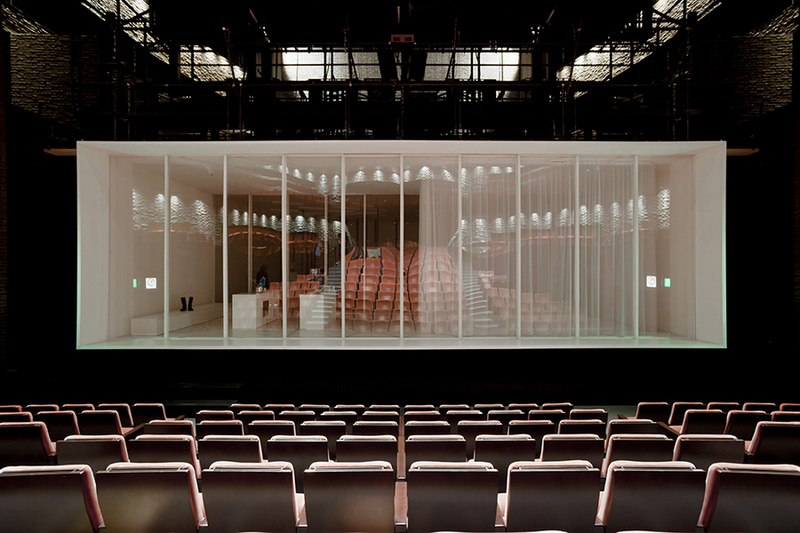 Miss Julie is a play for three actors and a chorus of fifteen inhabitants of Shizuoka that is performed in a white box installed in the theater at the Shizuoka Performing Arts Center constructed by the architect Arata Isozaki. 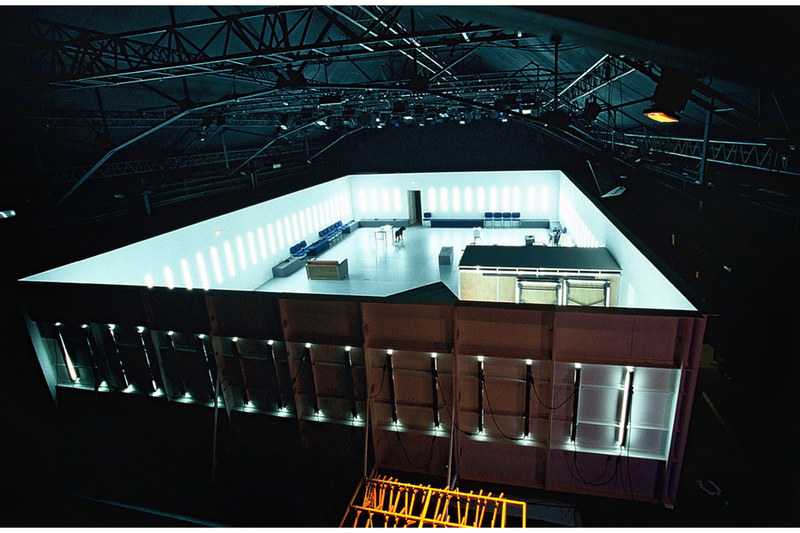 A “white cube” in a black box, the theater’s stage is often described this way. This apparatus is an abstract performance space visually freed from the traditional technical elements of the theater and thus produces a performative environment whose codes are the same as those of the art gallery. The group of objects brought together in this box — a bench, a coffee table, chairs, lamps, a kitchen, glassed panels, a curtain, and bamboo woods — are the artifacts necessary for the presentation of this fiction. fluorescent tubes, metal, dominos, Dimensions variable. Cast for the performances, the Festival d’Avignon and the Festival de Almada: Robert Cantarella, Johanna Korthals Altes, Frédéric Fisbach, Laure Mathis, Nicolas Maury, Émilien Tessier, and the dog Syp. The stage apparatus for this production of Robert Garnier's Hippolyte by Robert Cantarella is shared by the production of Alfred de Musset's text On ne saurait penser à tout by Philippe Minyana. A generic apparatus for two different plays. A shared common space for the spectators and the actors. The rehearsal apparatus is the performance apparatus. 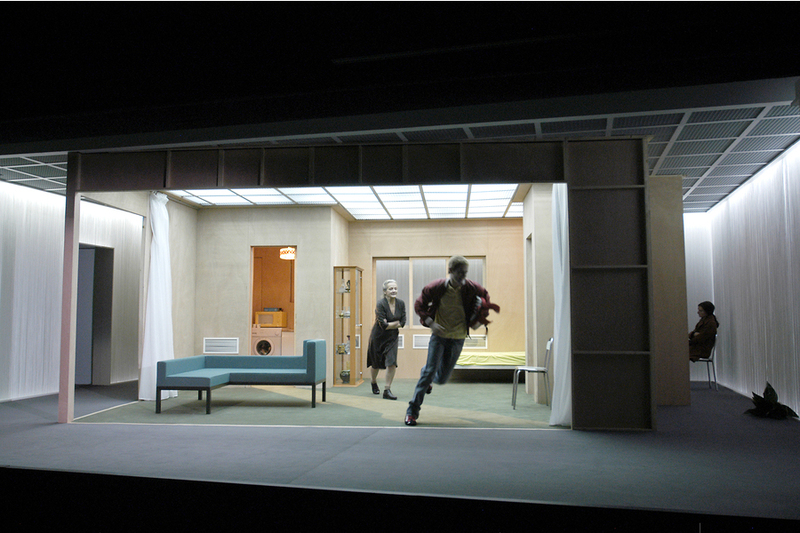 A peripheral partition unites all the elements necessary for the show: the control booth, space for the acting, lighting, props and the audience. A realistic set for two fictions: the seen and the read. unprecedented practices. 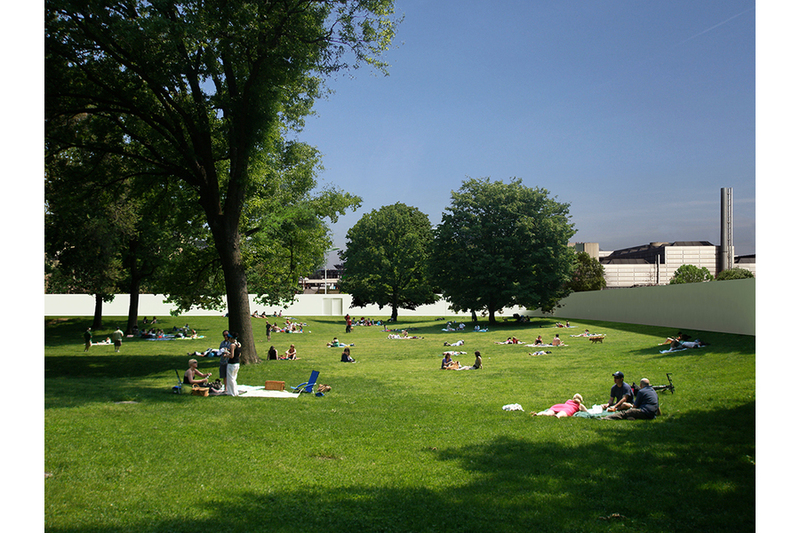 It is a public space open onto the garden in an atmospheric continuum with the island, a white space, modern, altered by the viscosity of the local climate. Notus Loci works through reversal; the white space of the gallery is that of production and the neo-Medieval wasteland of daily life. 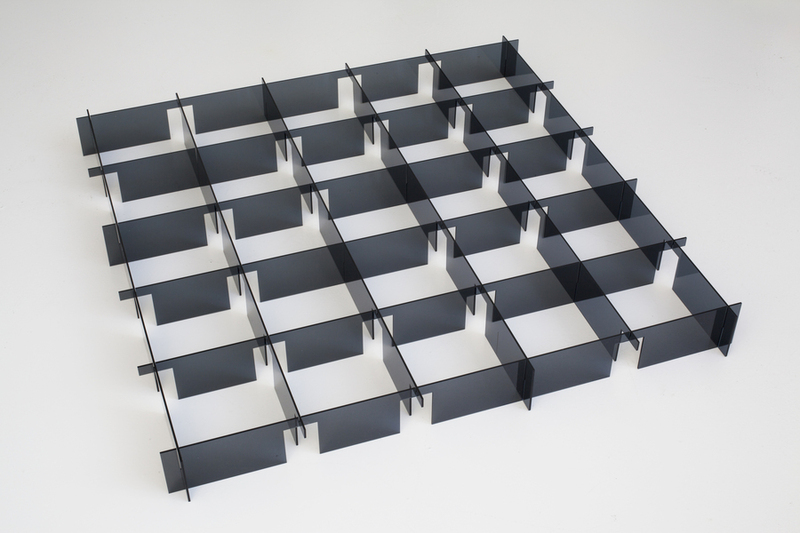 Perspex, 95 × 95 × 10 cm. Exclusive piece. Fluorescent tubes, metal. 150 x 150 x 20 cm. 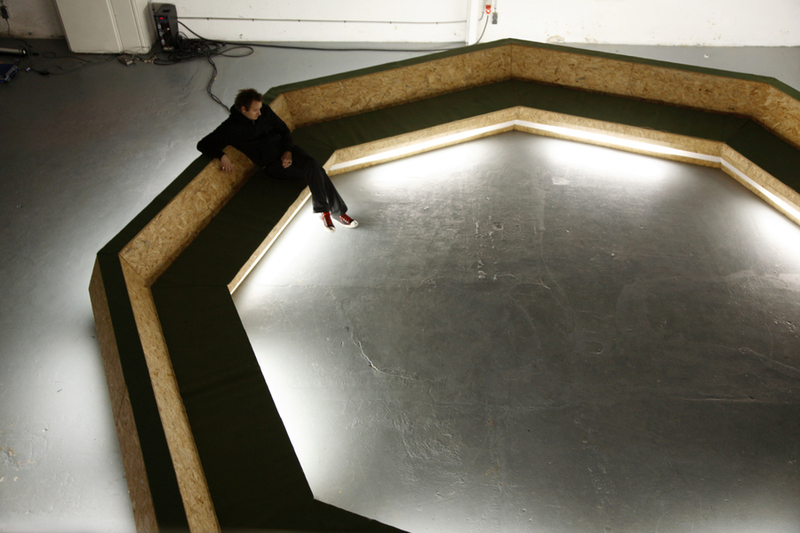 Initially designed for Philippe Minyana's play Ça va, directed by Robert Cantarella at the CDN in Dijon, this public alcove proposes one envelope set within another. This temporary movie is the result of a protocol for its use that goes beyond the constructed object: the dissolution of an architectural object into a fictional apparatus. 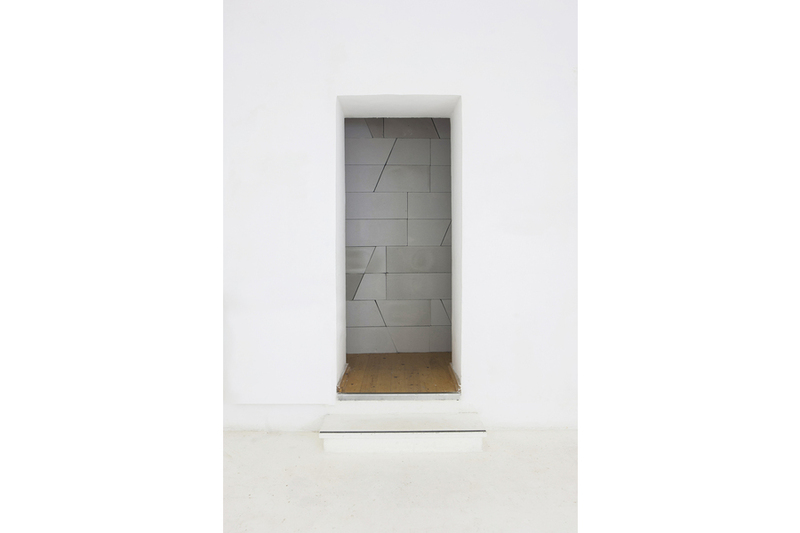 This piece of architecture constitues both the environment and the object of the fourth act of a play that successively unfolds in several spaces of the CDN in Dijon. 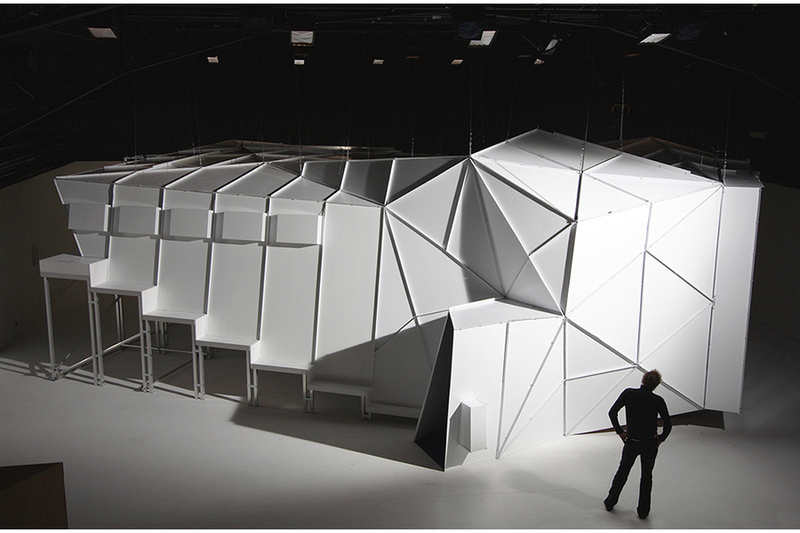 The morphology of this inhabitable decor answers to rules of acoustic compositions. To complete the exclusive relation of this theater to the projected film, each of the "decors" from the movies's scenes is presented as a photograph in the apparatus. Created with the collaboration of CRAFT, Limoges. Micro-granules of glass, white paint. Dimensions variable. artificial light. 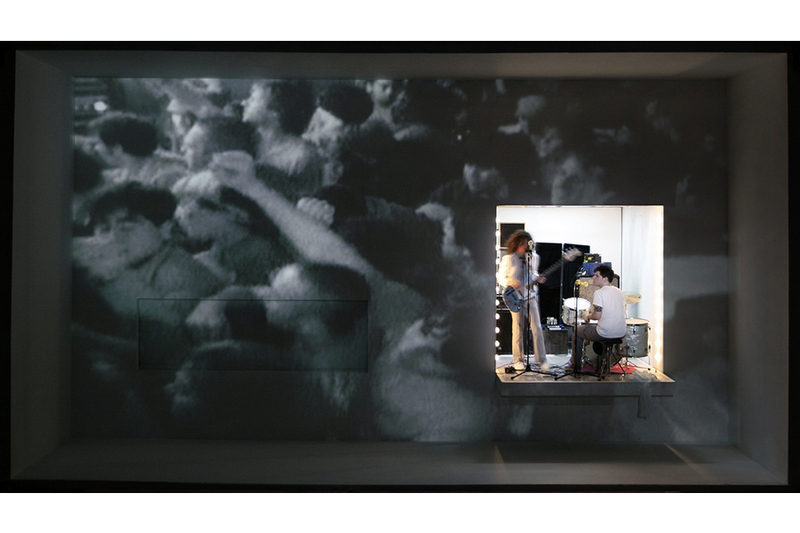 The walls then function as a beaded movie screen, returning most of the light projected onto it back to the direction of its source, that of the spectator. Paint is applied in the usual manner of a building painter. Traditional concrete, sands and river aggregates rolled naturally. 6 x 36 x 215 cm. Unique piece. Acrylic paint on cardboard mounted on oak. Diameter: 40 cm. Unique piece. Courtesy of the artist. 36 digital prints on baryta paper, 36 crystal paper envelopes, 1 cardboard box and 1 frame. (40 x 33 x 7.5 cm.) Edition of 3 + 1 EA. Courtesy of the artists. Series of drawings. Graphite on C to grain. 24 x 24 cm each. Glass, metal parts. 17 pieces of 12 (d) x 12 (h) cm. Unique piece. Marble. 28 x 19 x 18 cm. Edition of 3 + 1 EA. Courtesy of the artists. A series of prints combining text and photographic images. This serie of works on paper tries to reconstruct the progress of a march made on July 20, 2014 in the gorges of Trevans, commune of Alpes-de-Haute-Provence. This informations are silk screened with a reversible thermochromic ink, disappearing progressively above 21 ° C, the recommended temperature for the preservation of photographic prints. The cyanometer, invented in 1784 by Swiss mountaineer and naturalist Horace-Bénédict de Saussure, is an instrument for measuring the variations and intensity of the blue of the sky using the 53 chromatic values which constitute so many nuances of Cyan. By observing the sky in the mountains at different altitudes, the naturalist conceived this colored circle based on a blue gradient that served as a meteorological indicator. Its creator speculated that the color of the sky was linked to particles of water vapor suspended in the atmosphere. This piece, composed of 61 values, painted on 3 February in Paris, is the recreation of this formal scientific invention, it gives exclusive measurement tool and representation of the sky at this date. Mistères is the edition version, reduction of the work Mystère (2012). The latter consists of a series of 36 posters, each of which constitutes a combination of two complementary colors, opposite colors in the chromatic circle defined by Johann Wolfgang von Goethe. 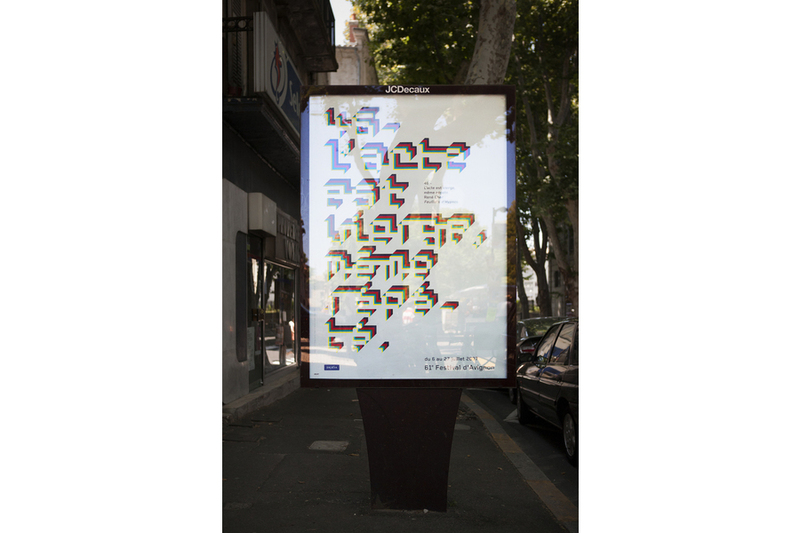 Printed in four-color, they are presented on advertising display media in the urban space. 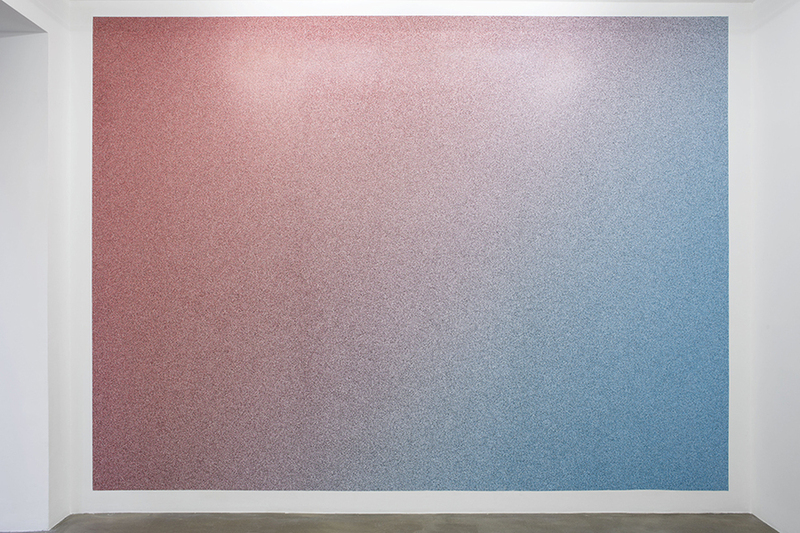 The box contains all of these degraded color combinations in progressive "slip". 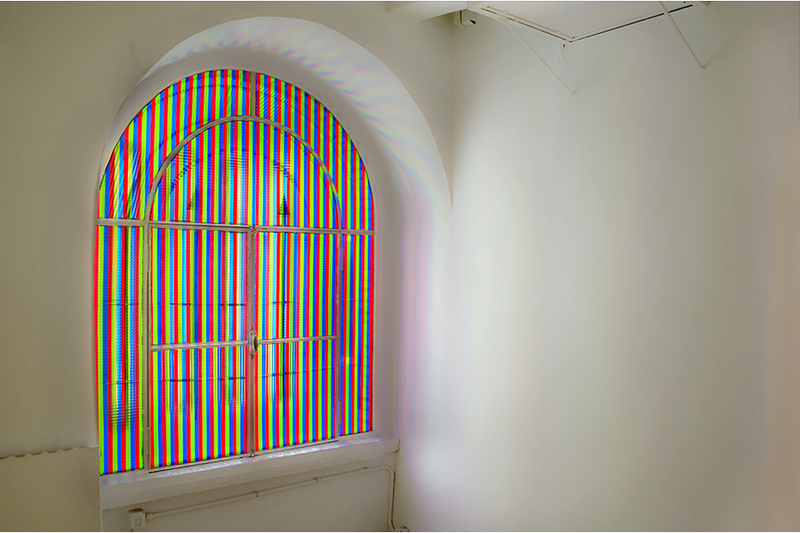 The chromaticity of each of these images is produced successively by the computer tool Adobe Photoshop and the digital printing method in RGB mode called subtractive synthesis. This new version is determined by the maximum number of pixels the print tool can process. The "mystère", initially spelled "mistère" in french, is a theatrical genre appeared in the fifteenth century. It consisted of a succession of animated and dialogued pictures written for a very wide audience, implementing stories and legends whose imagination and popular belief had been nourished. The supernatural and the realism were side by side. Sommeil Nerveux is made of a cluster of thirty-six silver-plated and varnished glass balls. This piece formalizes a ceiling lamp hung 1.50 m from the ground, housing the sources of light in twenty-four balls so that through a multitude of associations there appear as many regular geometric forms inscribed in the icosahedron formed by this chandelier. This structure, made with 14 blocks of cellular glass, occupies the diagonal of the space of the gallery. 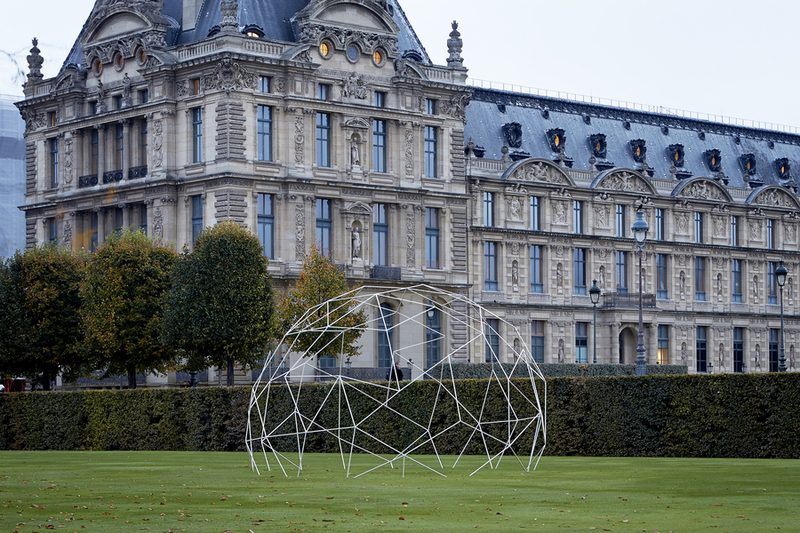 Only the ends of this sculpture are in contact with the architectural elements. 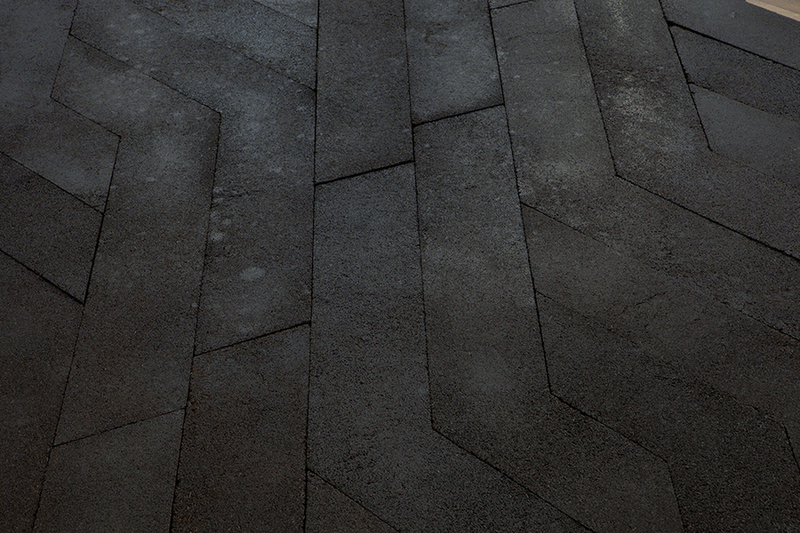 One end rests on the travertine floor, the other rests on the plinth. 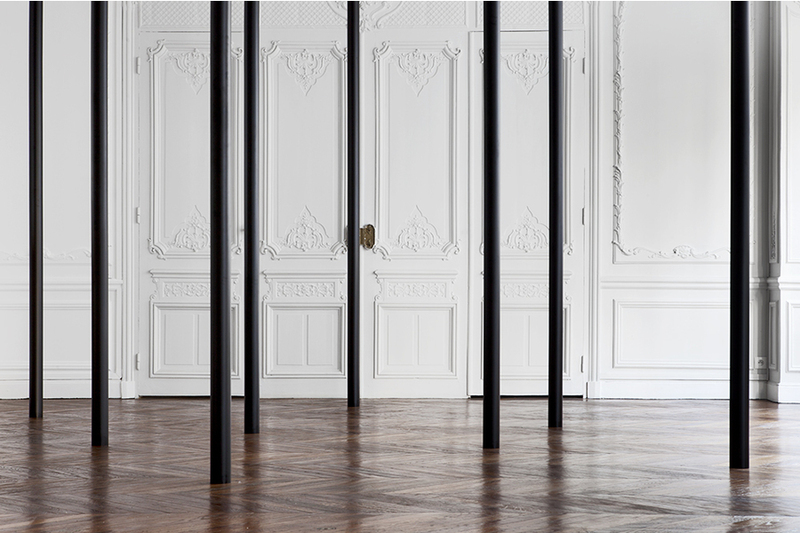 A solid walnut base allows this structure to cross the 765 cm which separate these two points in resisting the forces of tearing exerted by the tensioning of the blocks between them. Cellular glass is obtained from the fusion of silica, the main component of glass, and graphite, which is used in pencil mines. This work consists of a set of 17 objects in blown glass. It was realized at the international center of glass art of Meisenthal. 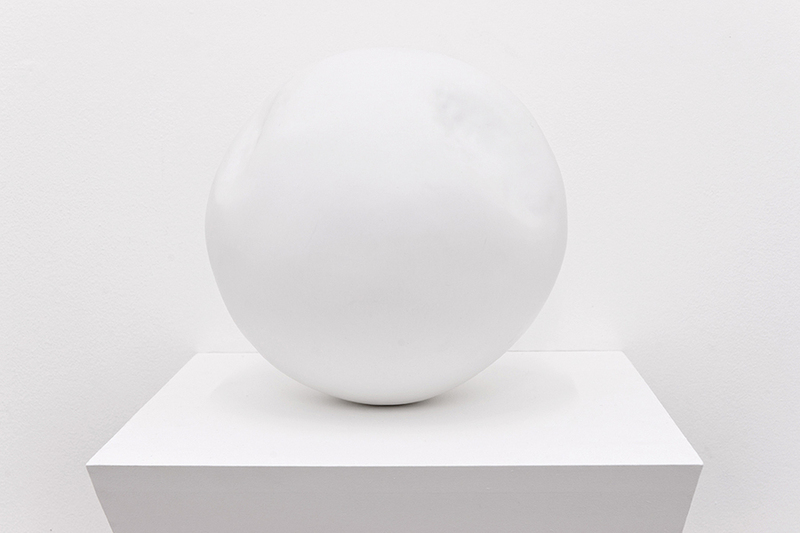 Each of the objects constitutes simultaneously the unique element of a chromatic progression (fragment of the chromatic circle) and the singular rejection of an object blown and formed using a single mold for all 17 pieces. This work presents 17 variations of breaking of the object at the output of cane under the random and manual action of the blowers. The blown part inside the mold has been cut and removed. The mold used is from the collection of the art center. The pigment of color is applied artisanally by the blower, the formation of the glass object is therefore simultaneous with the appearance and the definition of its chromaticism. of anonymity, even as major cities aretempted to saturate all spaces with light and visibility. Iron sulfide in folded strata. On loan from the Pierre and Marie Curie University collection, Paris. 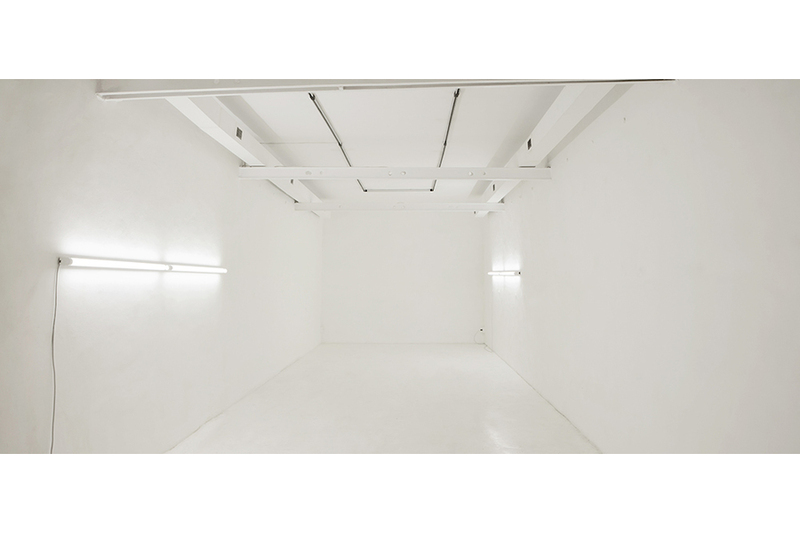 Wood, fabric, 100 white cold fluorescent tubes, 100 white warm fluorescent tubes, electrical program. From the sun to the cloud (from 3 000 K to 6 000 K) is a ceiling light hung in the Mudam’s great gallery. 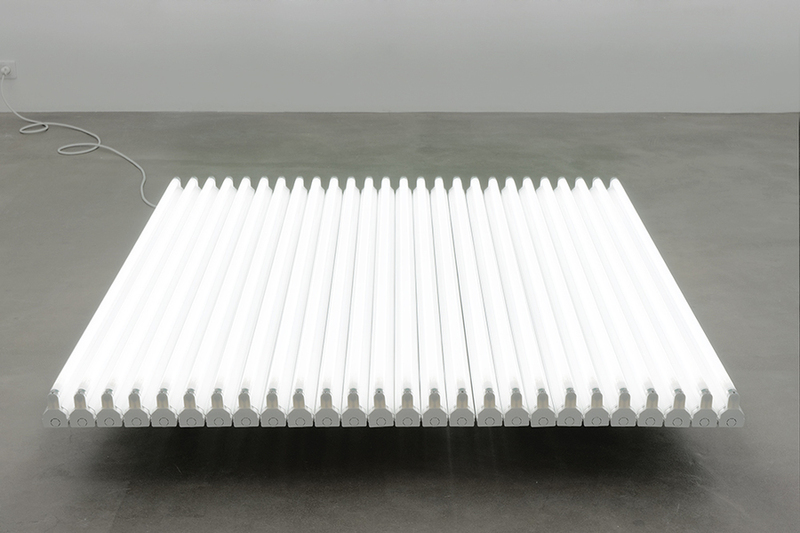 Affixed by its upper part, the fluorescent tubes, half of which are hot white and half of which are cold white, alternatively amplify the variations due to the perpetual mix between artificial lighting and the light of day that comes from the sawtooth roof, changing the luminous ambiance and simultaneously modifying the perception of the space and the exposed works. In 1843, Braid showed that the state he called hypnosis is a particular physiological state that can be obtained using a simple method: staring at a candle flame. This new method definitively disproves the hypothesis of the fluid of Franz‑Anton Mesmer, who uses the term “animal magnetism”, and replaces it with a neurophysiological explanation. an environment that solicits the brain that regulates exchanges, sensations, and perceptions. It is related to a model of cognitive mediation that plays on the permeability between mind and body. If the psychiatric approach through medicine allows the body but particularly the mind to self-regulate, Sommeil Nerveux works through the more mental slant of suggestion, a resurgence of the hypnotic model. Electrically powered with a program that follows a protocol of regular switches on and off, Sommeil Nerveux is made of a cluster of thirty-six silver-plated and varnished glass balls. 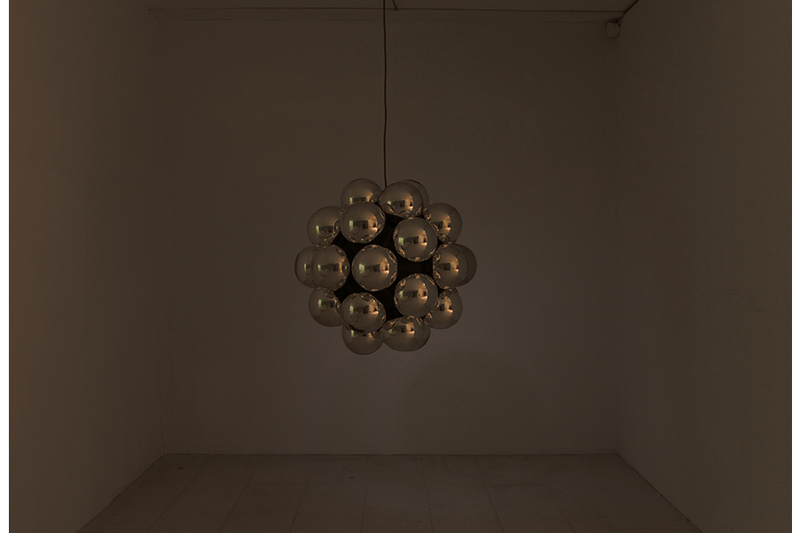 This piece formalizes a ceiling lamp hung 1.50 m from the ground, housing the sources of light in twenty-four balls so that through a multitude of associations there appear as many regular geometric forms inscribed in the icosahedron formed by this chandelier. 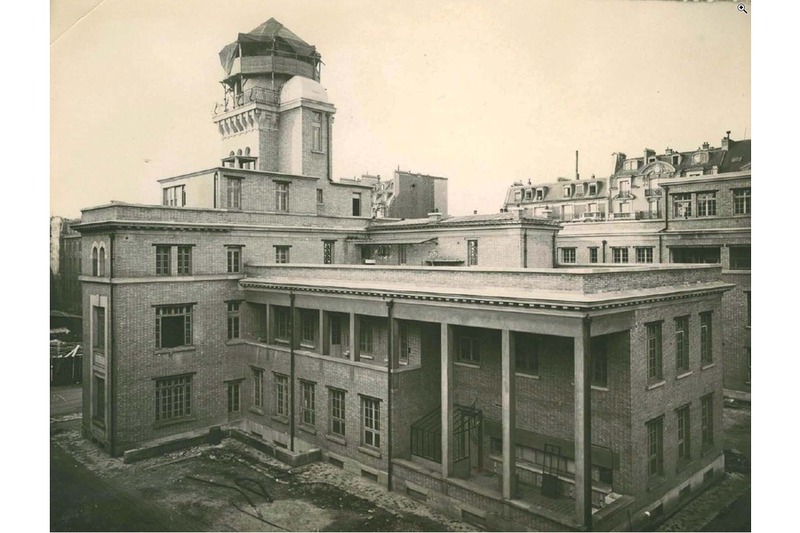 Extension of the Henri Poincaré Institute in the "Jean Perrin" building (1922-1926) built by Henri-Paul Nénot. Pierre et Marie Curie Campus, 5th arrondissement of Paris. Mathematics research institute part of UPMC Sorbonne Universités, in association with the Centre national de la recherche scientifique (CNRS). 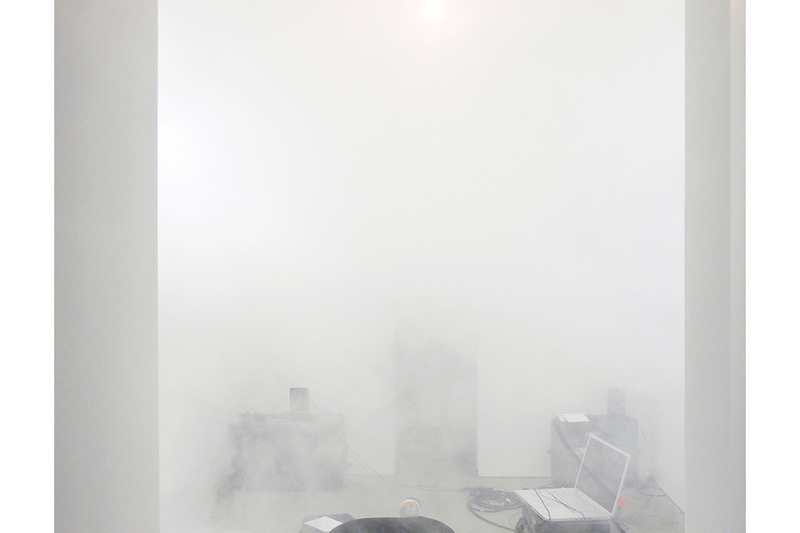 Fog machine, sound installation. Dimensions variable. A theatrical display in an artificial environment. The formation of a smoky cloud, contained in a confined indoor space. Wood, white fluorescent tubes, electric programmer. 220 x 360 x 35 cm. Grand Opening exhibition, Watermill Center, New York. A sign at the Grand Opening exhibition at Watermill Center. 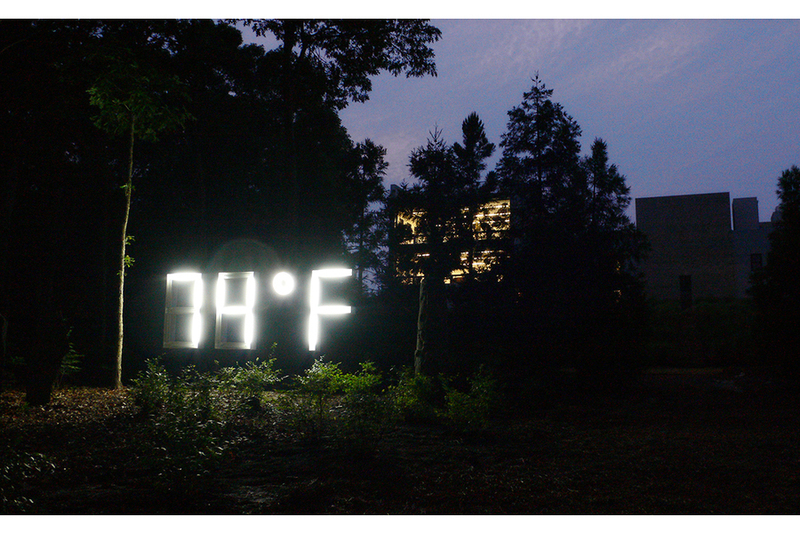 Through a real time temperature calculation, the lit sign displays an adjusted temperature that is more comfortable than the real surrounding temperature. Mystère is composed by a series of thirty-six posters that each constitute a variation and combination of two complementary colors, opposite colors on the color circle defined by Johann Wolfgang von Goethe. 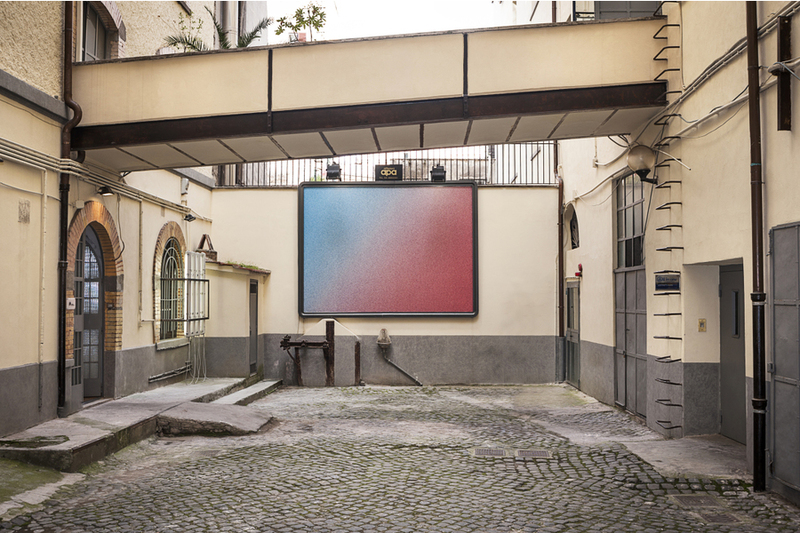 Presented on the city’s advertising billboards, the posters display “altered” colors that present the color circle in an undefined way, through a progressive “slide”. An undetermined range of color successively affected by the digital production tool and the traditional procedure for printing in four colors referred to as CMYK (Cyan, Magenta, Yellow, and Key).